Jewellers from around the country have entered their inspired and beautiful collection of wearable pearl jewellery pieces…and we’d love to hear which is your favourite. 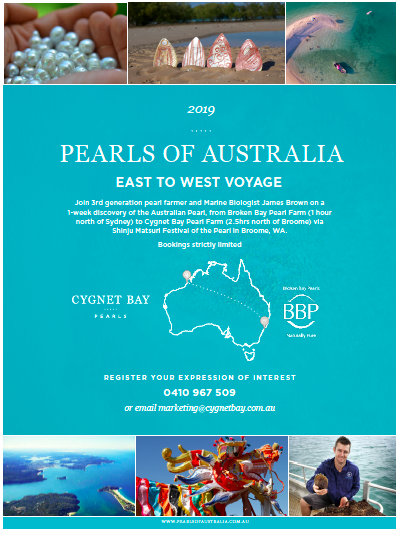 Just by voting, you will go in the draw to WIN a seat on the 2019 PEARLS OF AUSTRALIA EAST TO WEST VOYAGE worth $8,500! 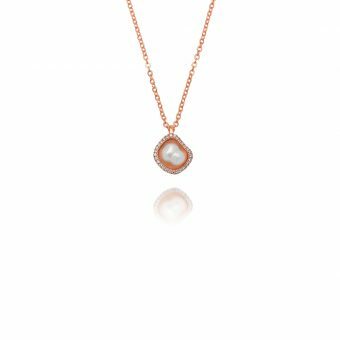 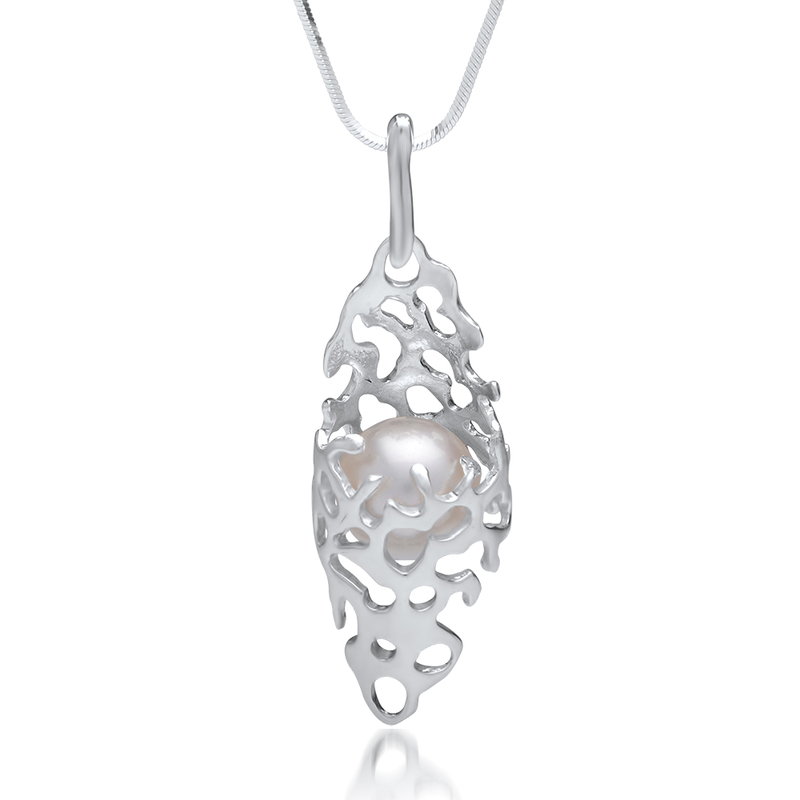 Second prize is a Kimberley Lily diamond pendant from Cygnet Bay Pearls worth $870. 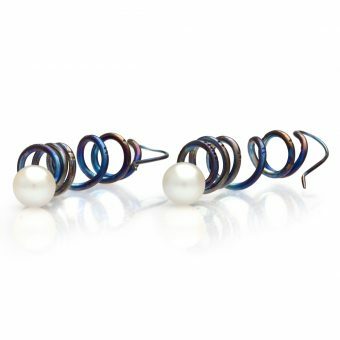 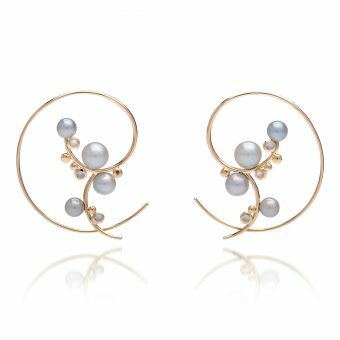 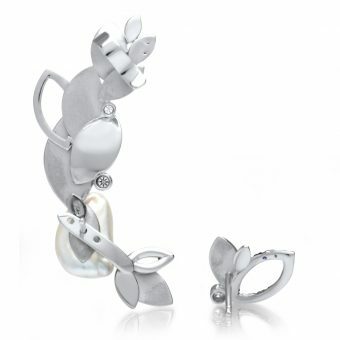 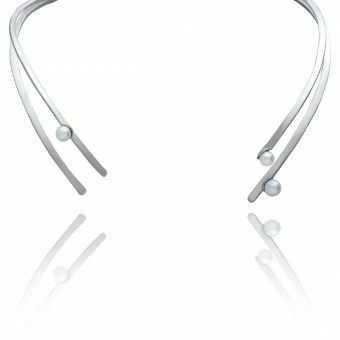 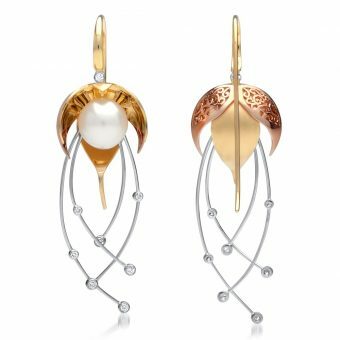 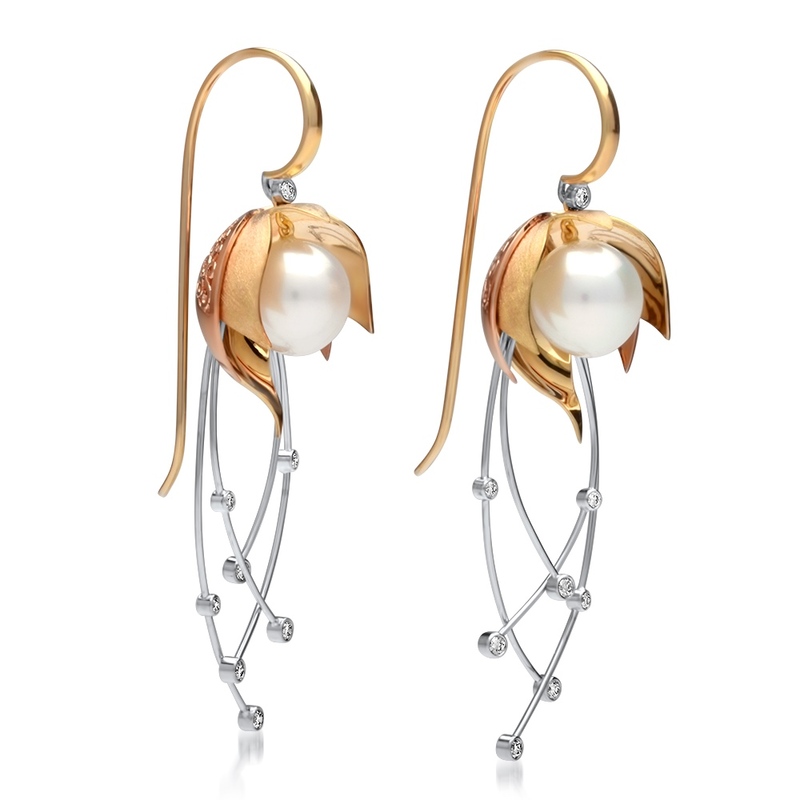 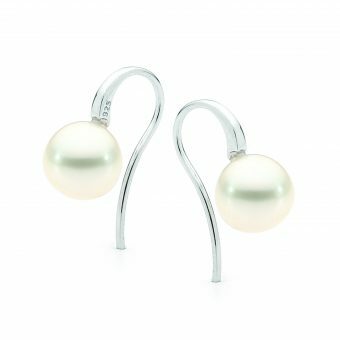 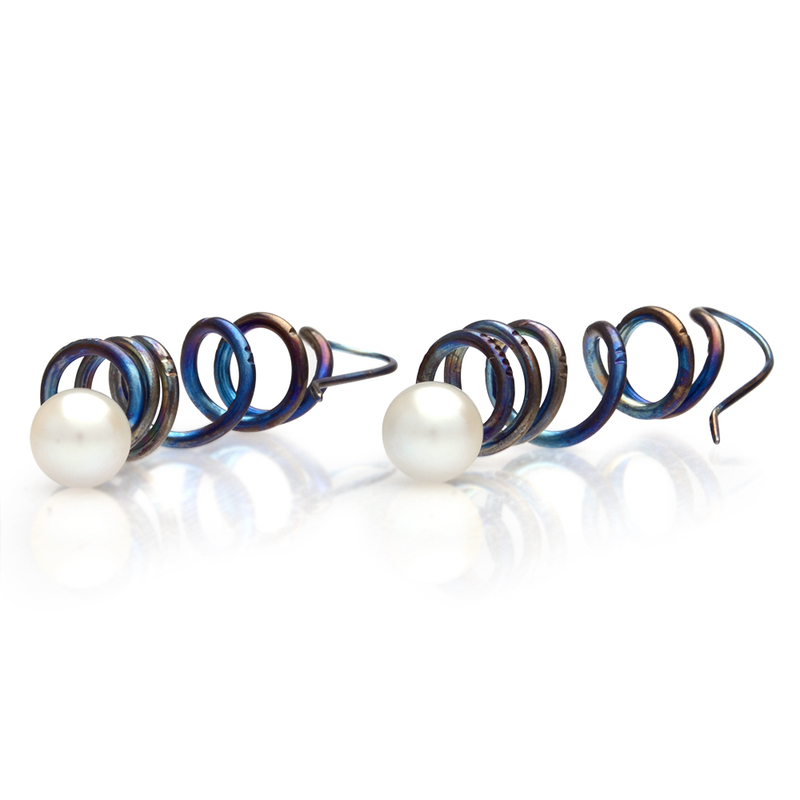 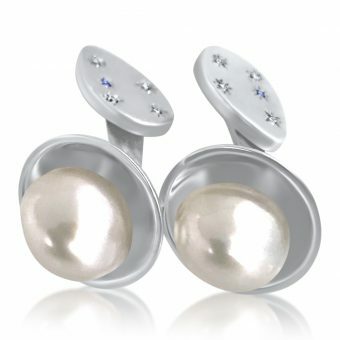 Third prize is a pair of Akoya hook earrings from Broken Bay Pearls worth $350. Only one vote per person will be accepted so please choose carefully! 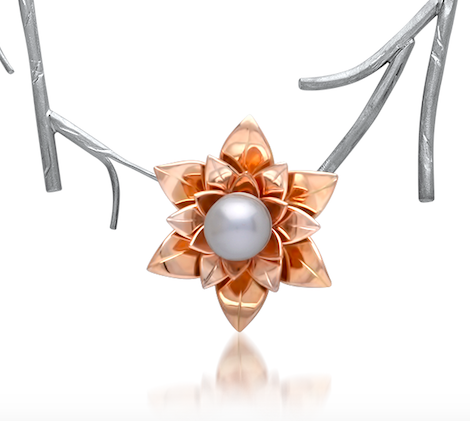 We have recently changed the mechanics of this competition which means your vote must now be cast by submitting the entry form at the BOTTOM OF THE PAGE. 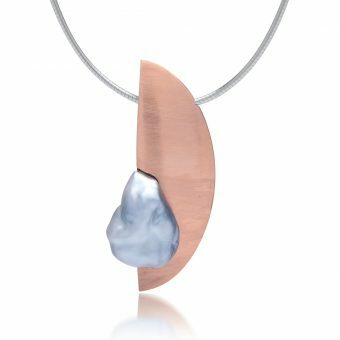 Entries close 5pm Friday 23rd November. The designer with the most votes will receive $2,000 cash, a 13mm Drop pearl worth $1325 and a $500 Pallion voucher. 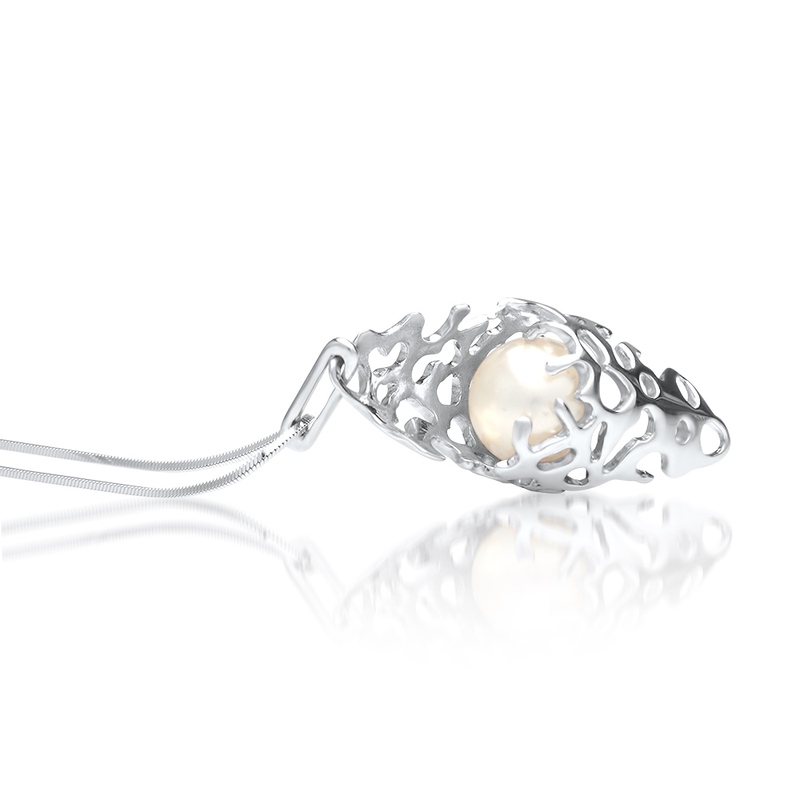 The Rock Pool. 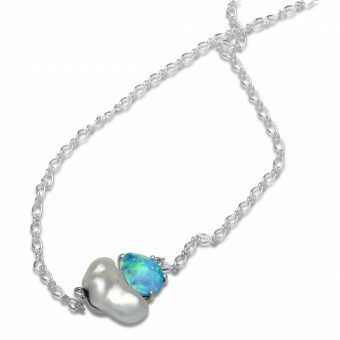 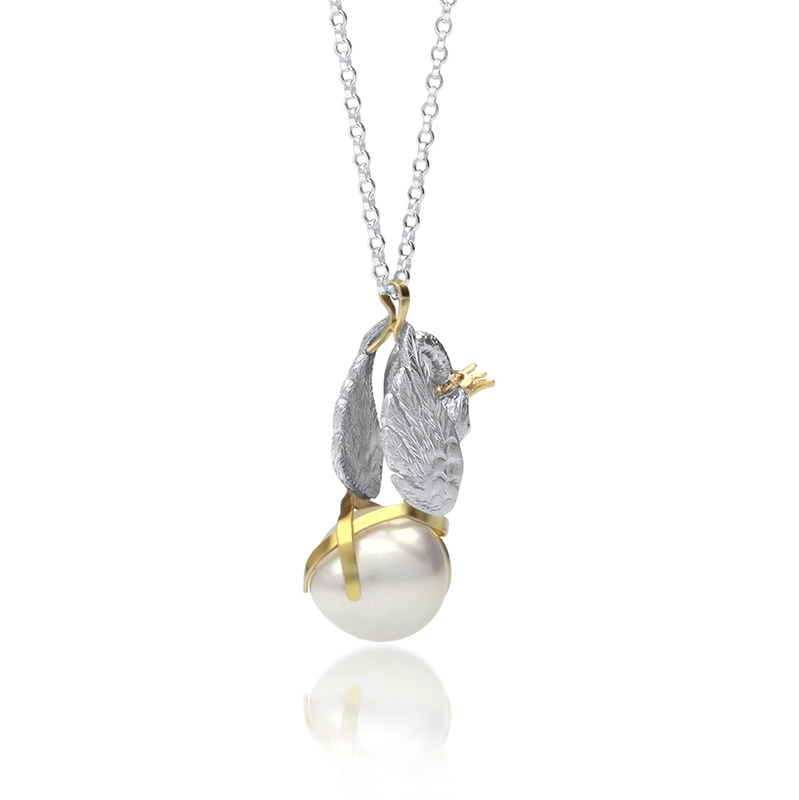 The inspiration to create a beautiful organic jeweller piece to capture the beauty of the Cygnet Bay Pearl. 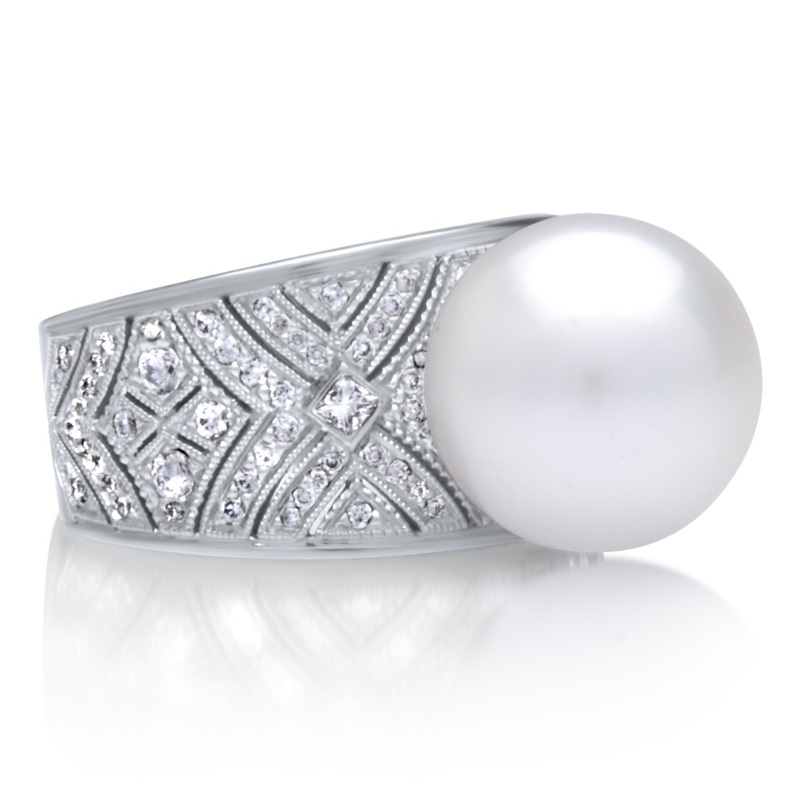 As we gaze at the restless ocean, we wonder at the secrets it holds. 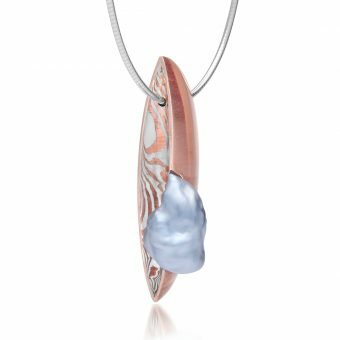 The stunning Cygnet Bay Pearl is just one of it’s many treasures constantly caressed by the salty waters, represented by the mokume gane as it flows across the tops of the fingers. The divine full moon with three of its guardian stars. 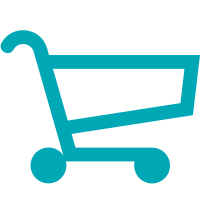 37 Years ago a massive storm, larger than the diameter of Earth, was discovered on the North Pole of Saturn. 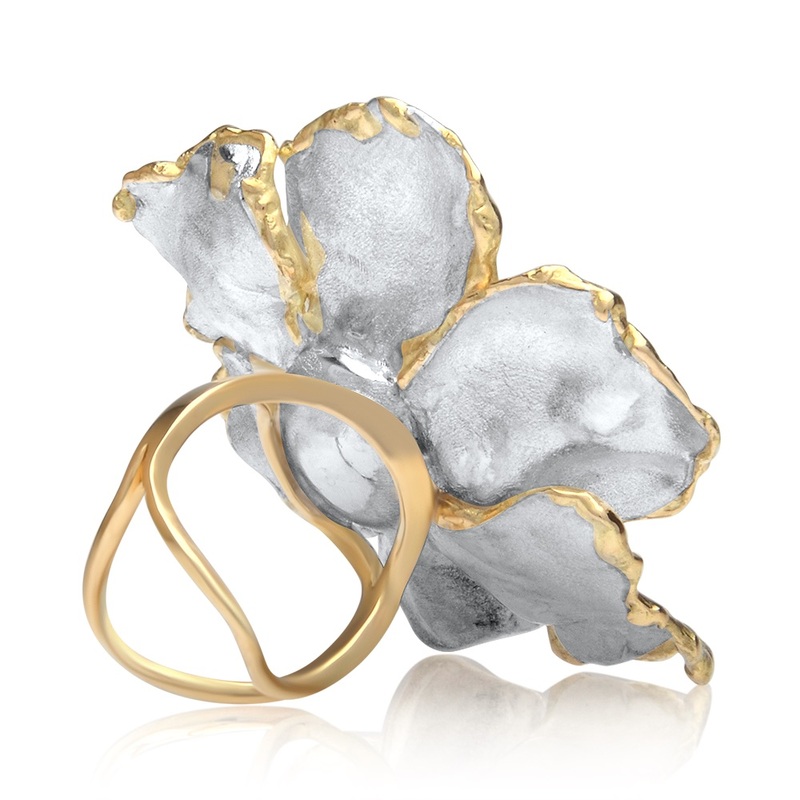 The turbulent cloud forms a hexagonal shape that does not shift in longitude but over the years has changes from blue to more of a gold colour. Nephila Lucilia was made in the image of the golden orb weaver spiders that surround the Cygnet Bay Pearl Farm. 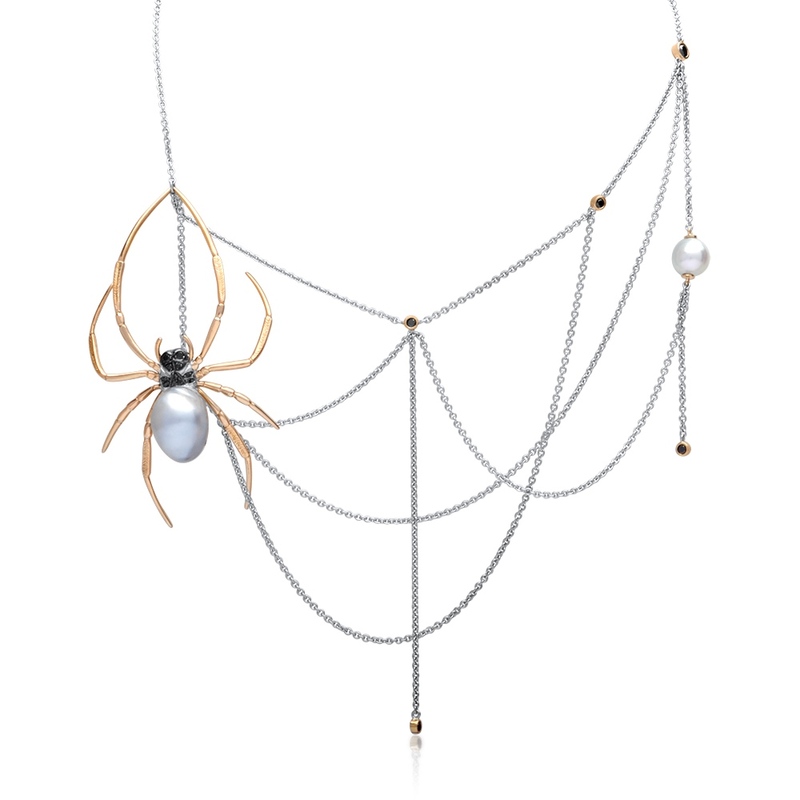 The name Nephila Lucilia is taken from the scientific names of the golden orb weaver and the green bottlefly. 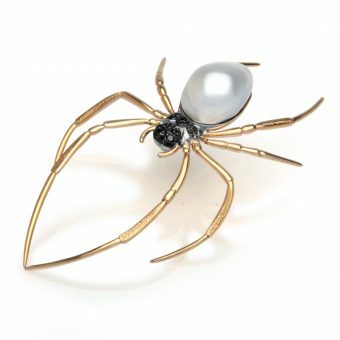 The spider itself is a detachable brooch. 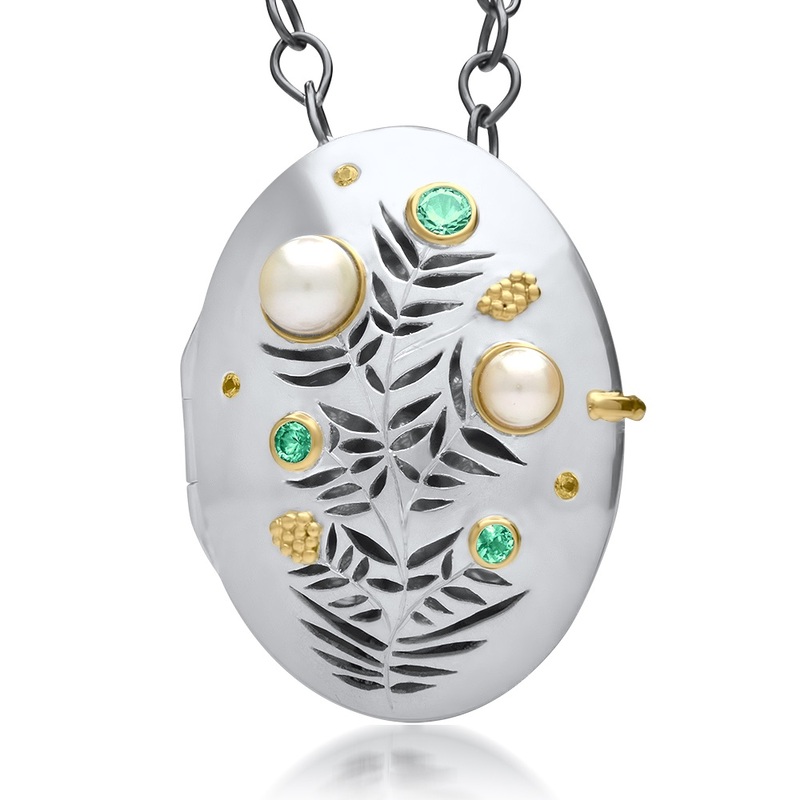 The wattle is one of our most enduring national symbols. 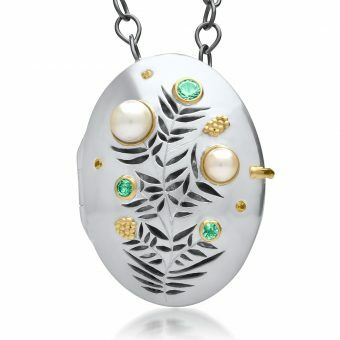 It has been part of the aboriginal culture for thousands of years, it’s the inspiration behind our national colours, green and gold and is the official floral emblem of Australia. 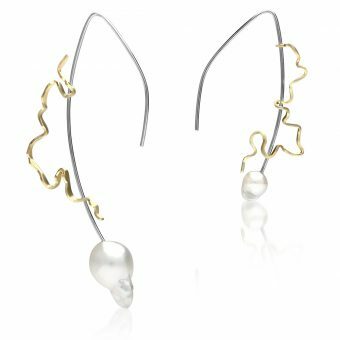 The Pirarr- Pirarr is the aboriginal name for the Acacia Adoxa found in the wider Kimberley region. 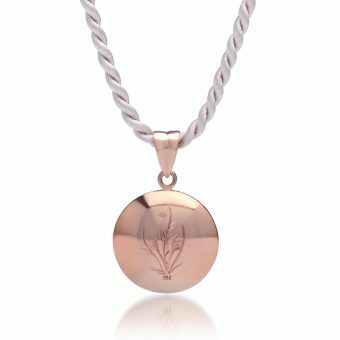 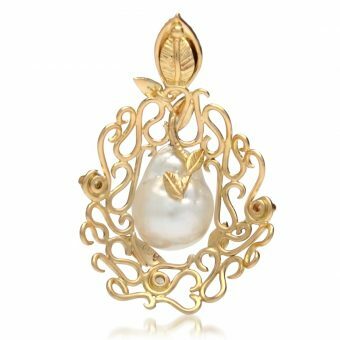 The wattle and its blossoms have been handcrafted onto the front of the locket with Broken Bay Akoya pearls as the flowers. Inside is a hidden plume of Tasmanian blackwood acacia flower known for its soft, yellow off-white blossoms. 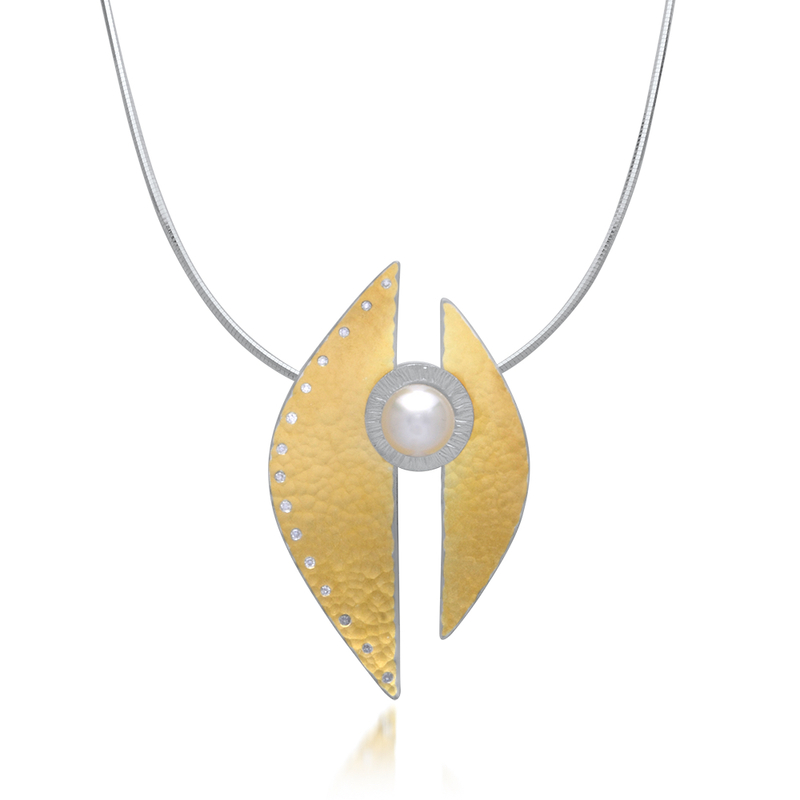 The chain is shaped, coloured and inspired by the seeds of the wattle. Wattles are usually the very first plants to germinate after a bushfire and are seen as a symbol of resilience, renewal, of people starting again after adversity – the true Australian spirit. When the blaze of wattle lights up our landscape every year, let’s remember that the Wattle is the Pearl at the heart of our country. “The Wattle-bloom means that her heart is of gold…” — Henry Lawson. 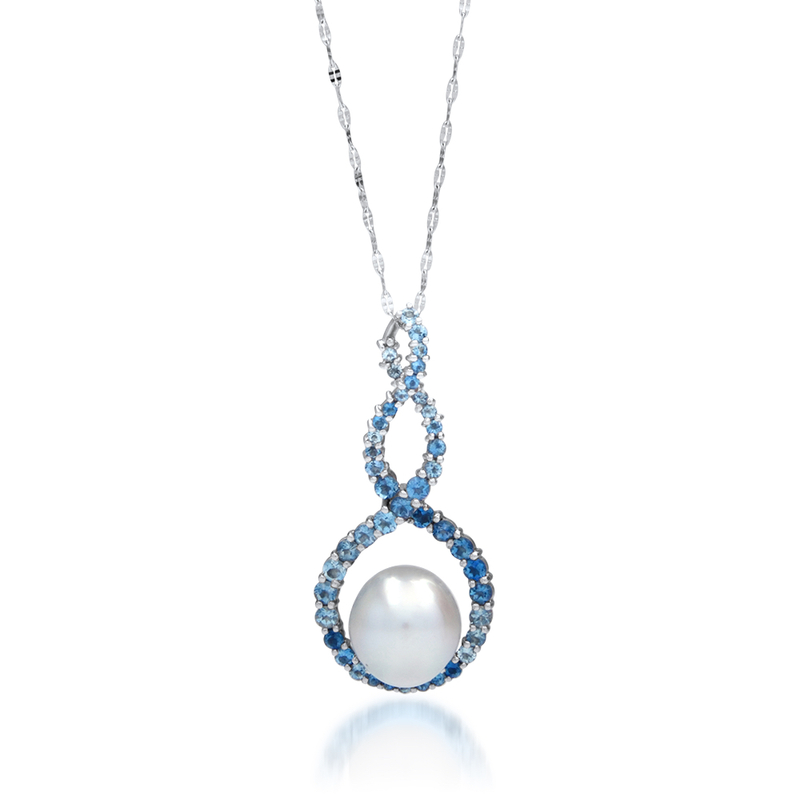 The infinite movement of water delicately holding the pearl. 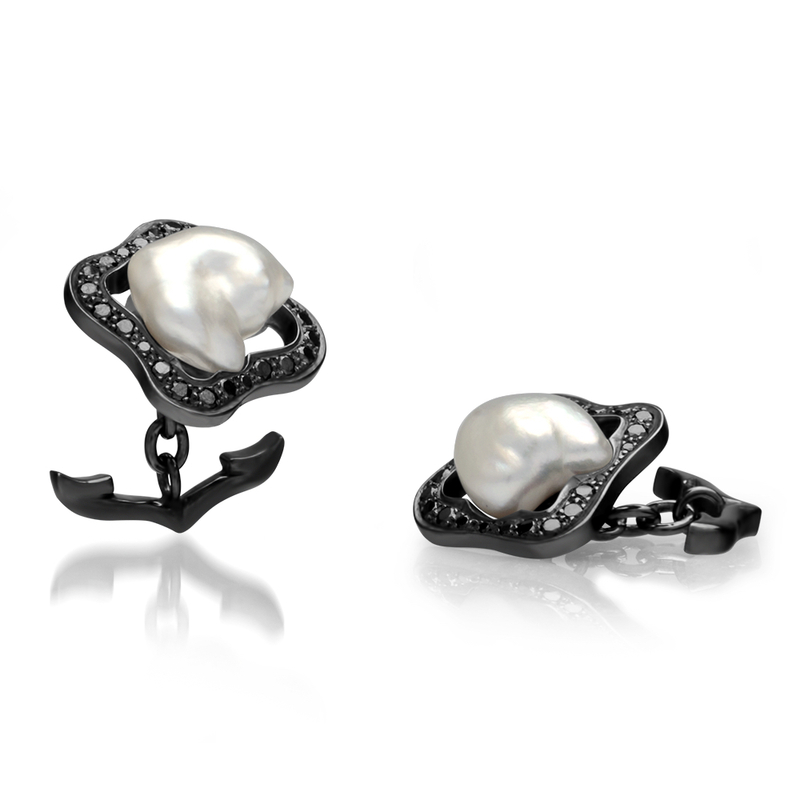 Black to contrast the beautiful white of the pearls. 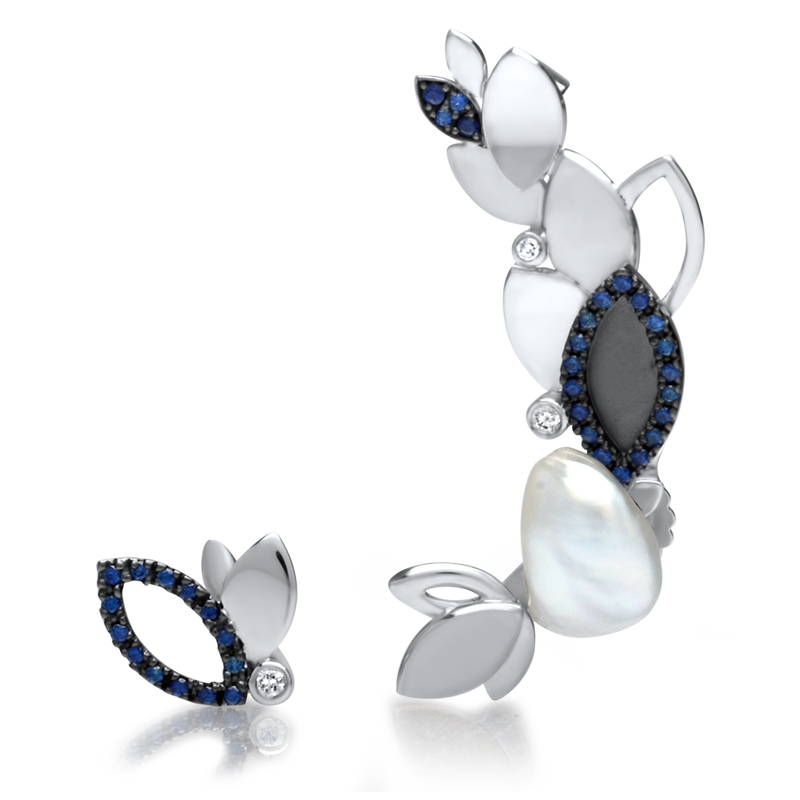 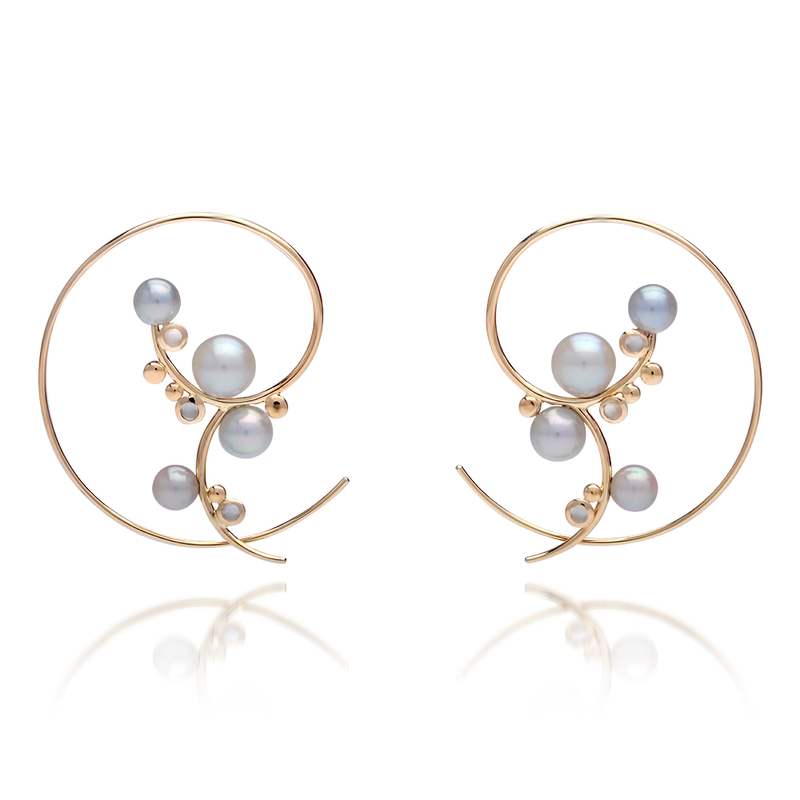 Pearls & Opals, a match made in heaven. 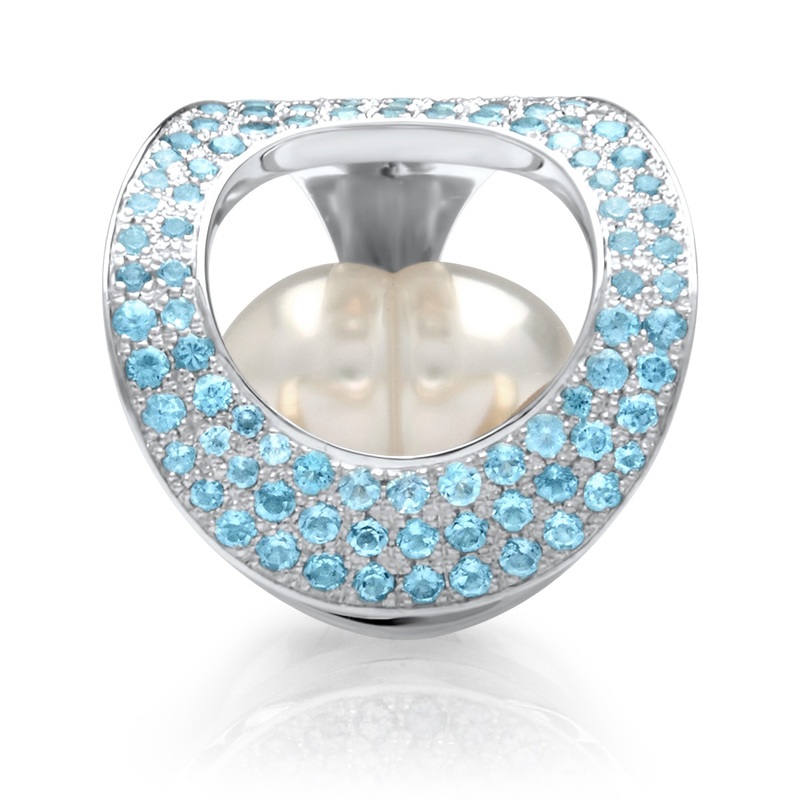 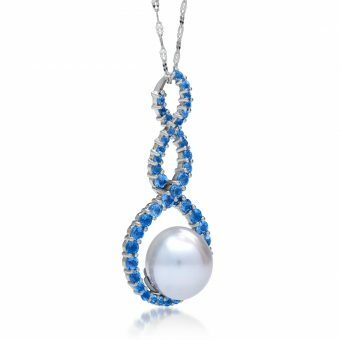 Ocean blues complimenting the smoothness of the pearl. 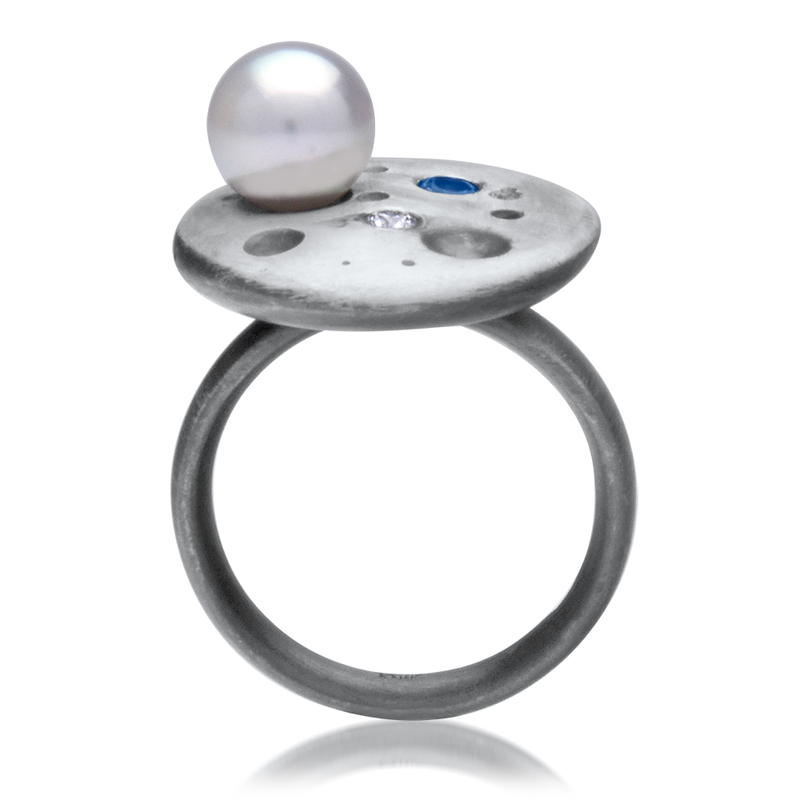 The connection between the Moon and the oceans has been a relationship since the creation of time. 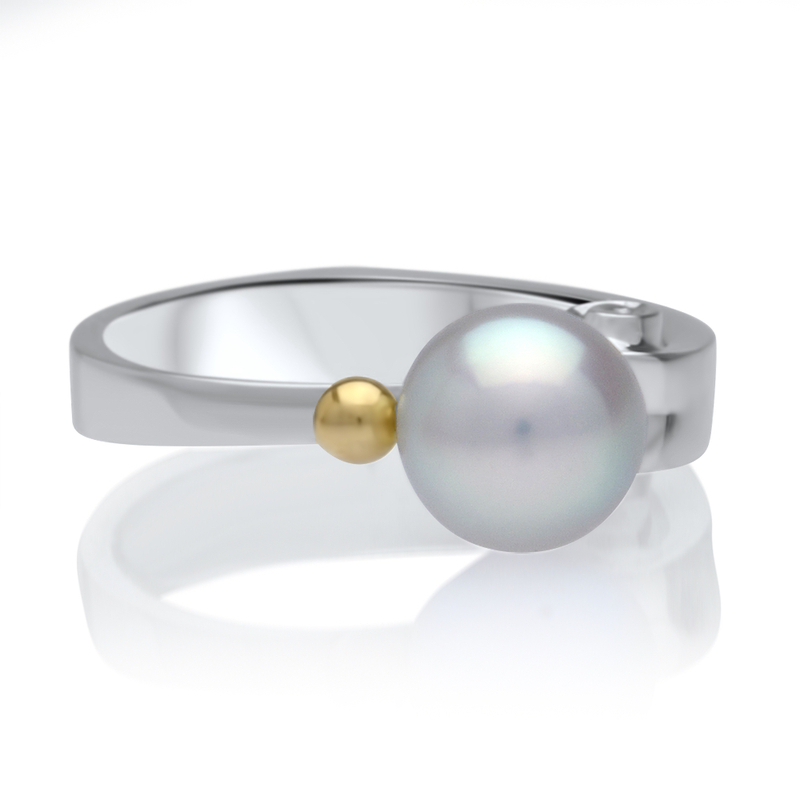 The Moon controls the tides and these in turn gently rocks and lulls a pearl into being. 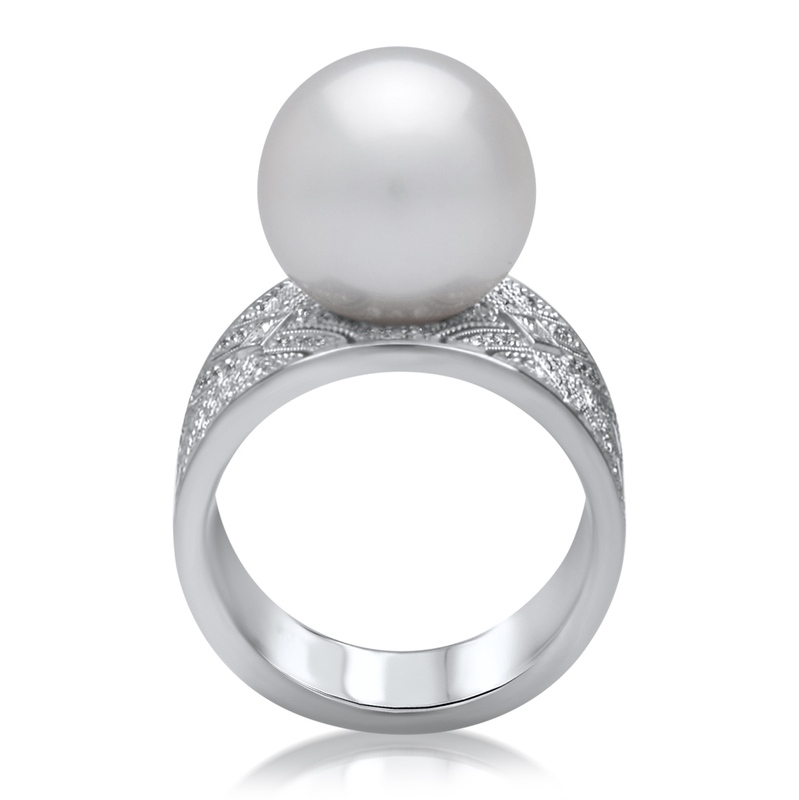 It’s as if a pearl is a tiny ray of moonlight I wanted this pale silver grey Akoya to sit in a crater, a shimmering moon beam, a ray of glowing light against a textured landscape. 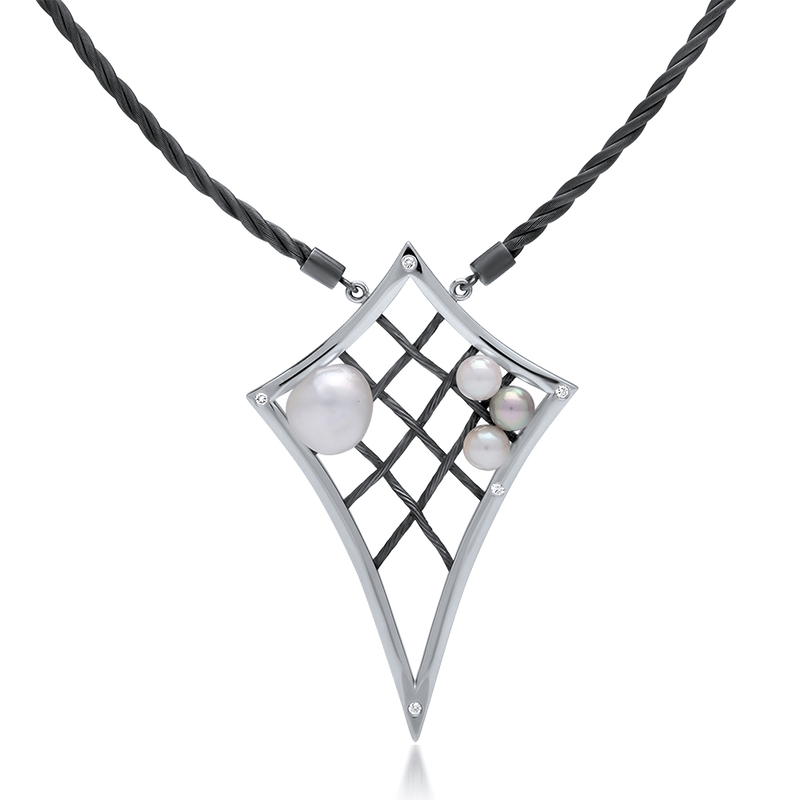 A contemporary twist on the classic diamond and pearl combination. I’ve made several rings in this “Moon” series, all set with different pearls, all unique in coloration and hue. 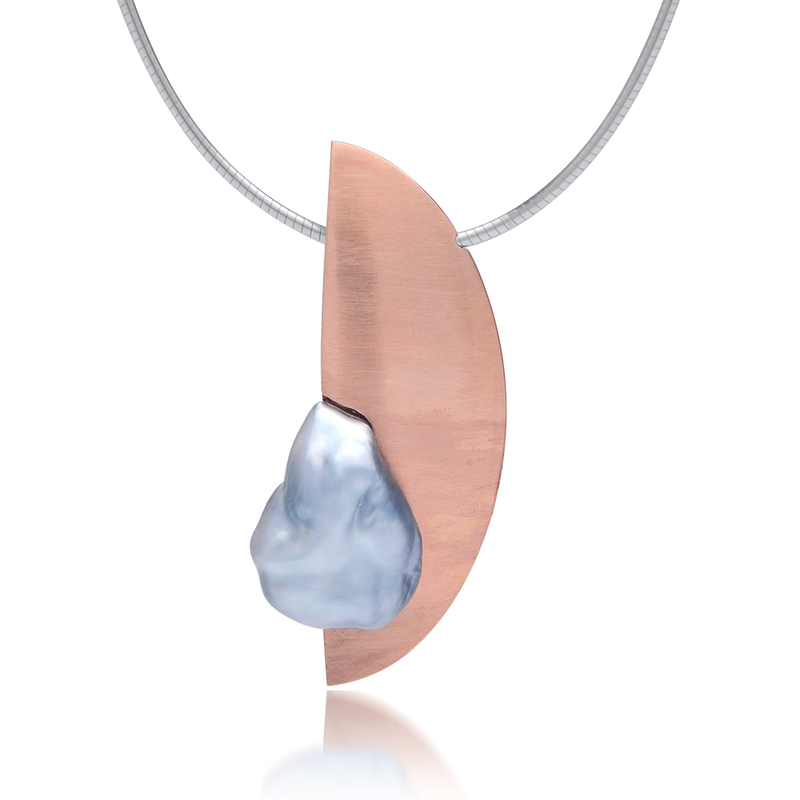 With this pearl and its subtle tones of pale silver pinks and mauves, I wanted to bring out its light, contrasting the dark iridescent colours of where it originated from. 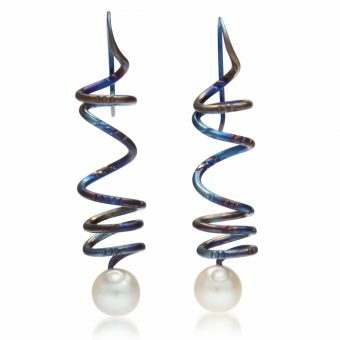 The deep reds, blues and golden hues created by hand painted oxidisation of the silver, celebrates not only the pearl, but the celebration of the oyster from which it came. 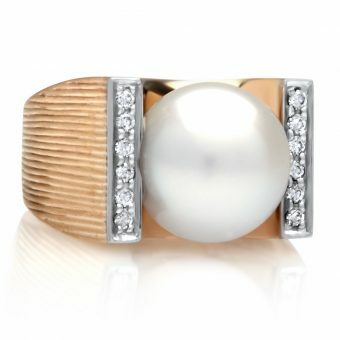 This ring celebrates the brilliant lustre of a Cygnet Bay Pearl in concert with the motifs of the Art Deco period: luxury, glamour and exuberance. 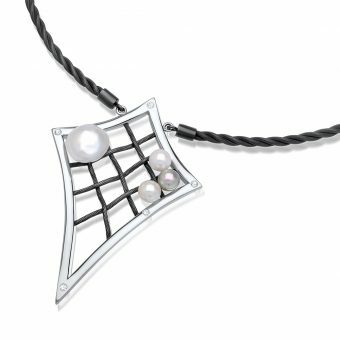 Set in a band incorporating the memorable themes of flowing cubism, brought to life by the careful placement of 112 hand-picked diamonds, the design pays homage to a hopeful time after the Great War’s end. 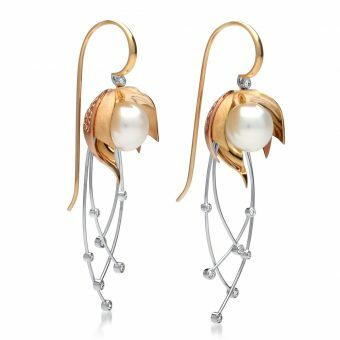 This was a period when rich materials, exquisite craftsmanship and modern styles were used with abandon, matching the world’s overflowing optimism. 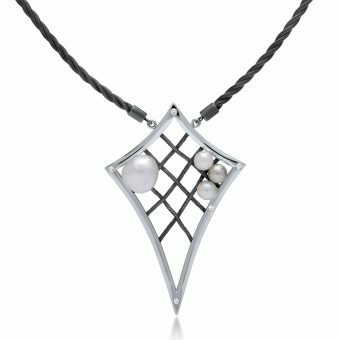 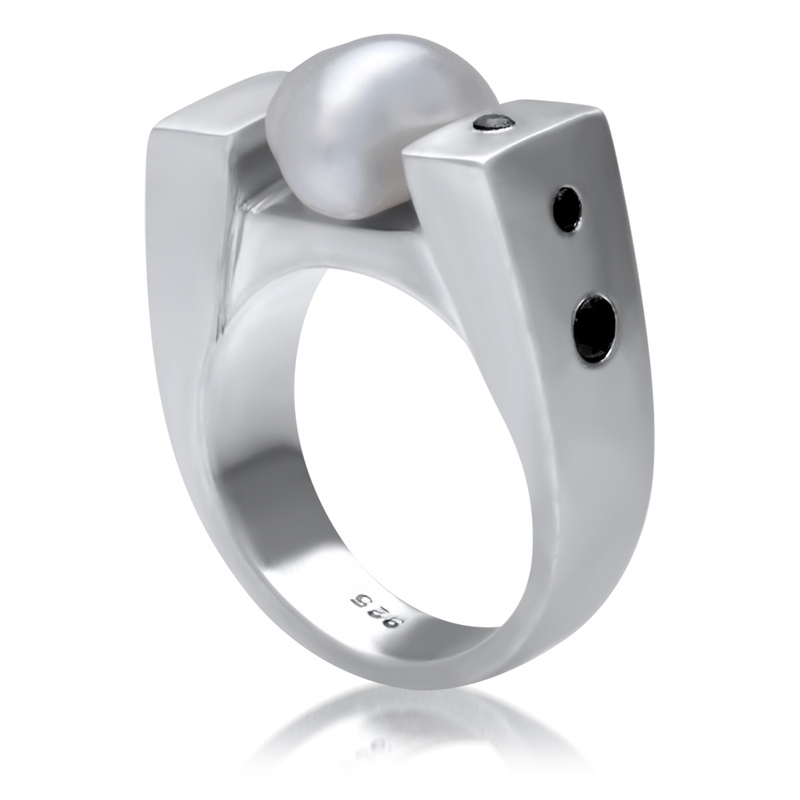 Platinum, Sterling Silver with Cygnet Bay Keshi Pearl 11mm A grade, Broken Bay and Australian Argyle diamonds TDW=0.125ct. 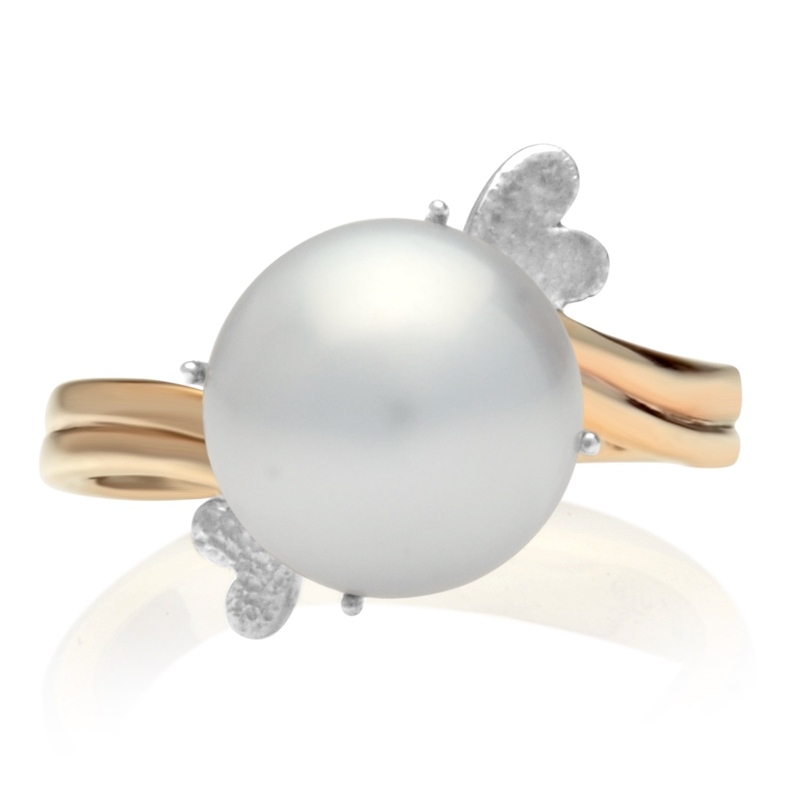 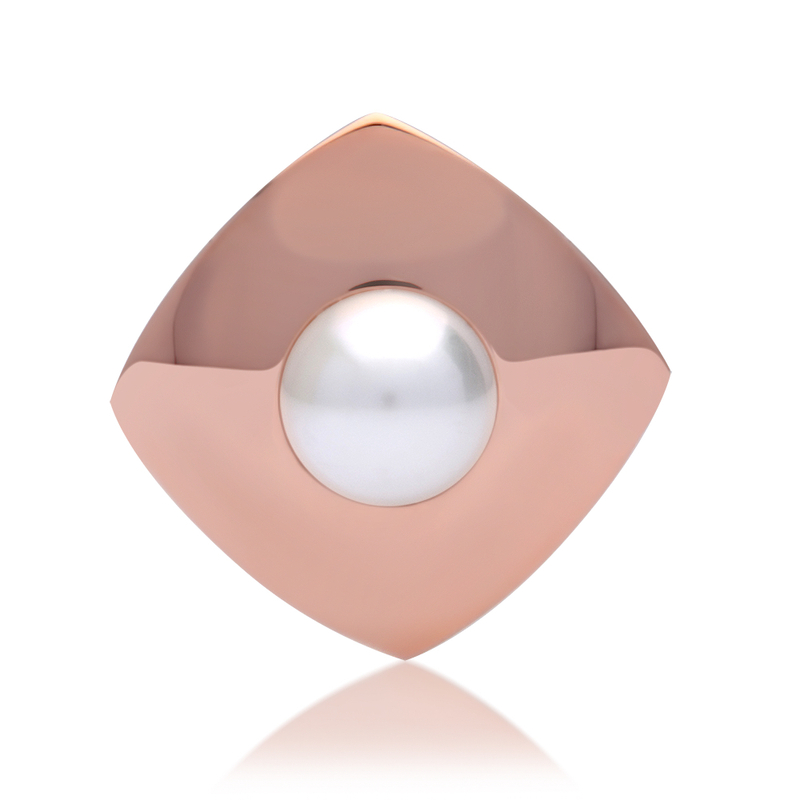 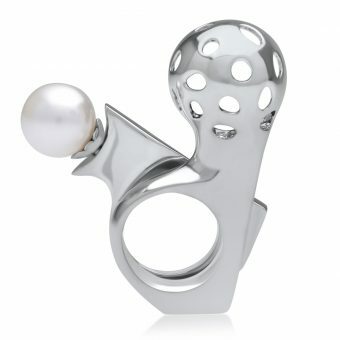 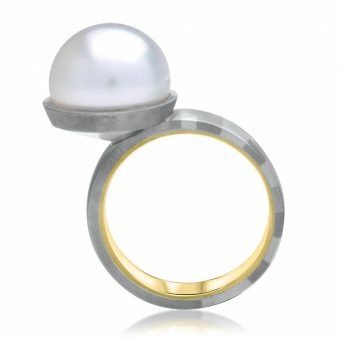 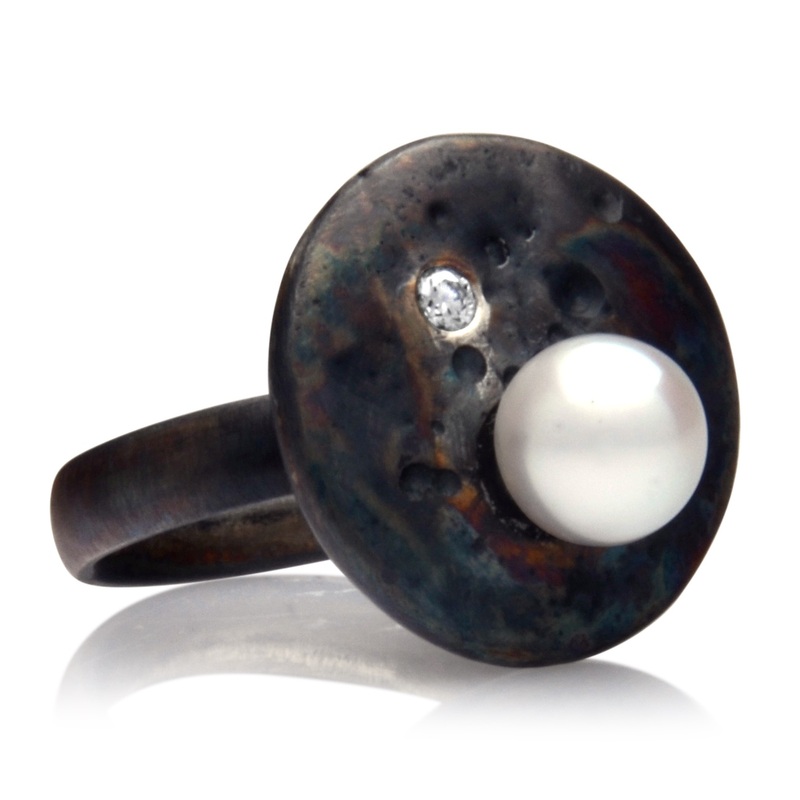 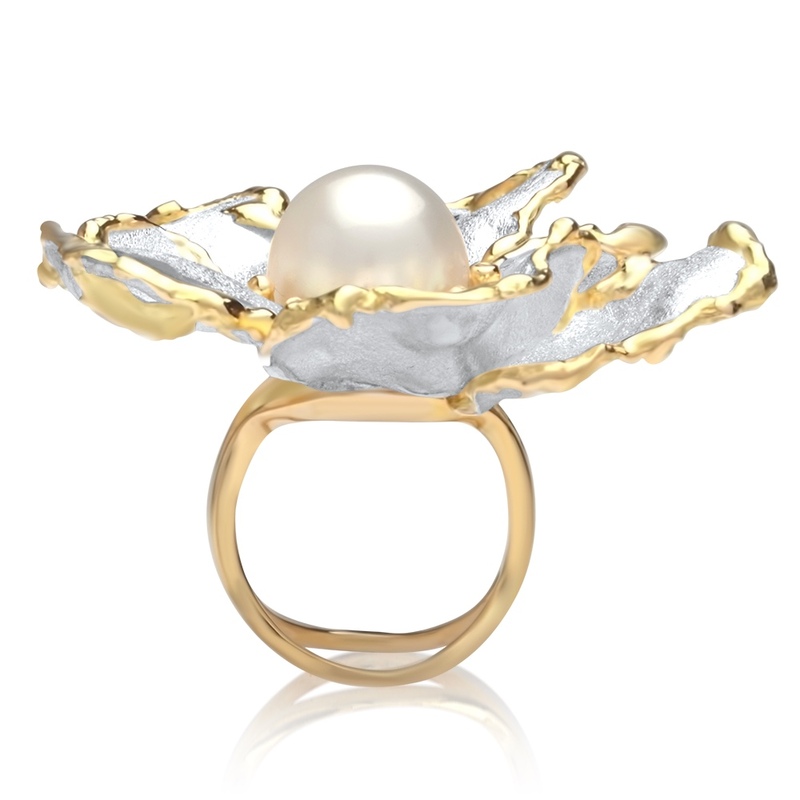 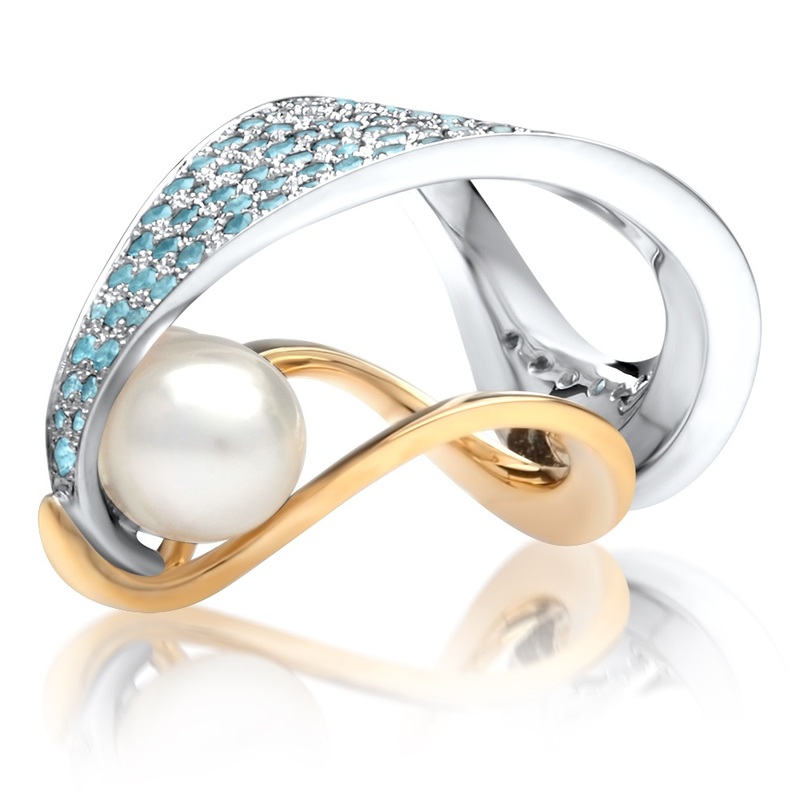 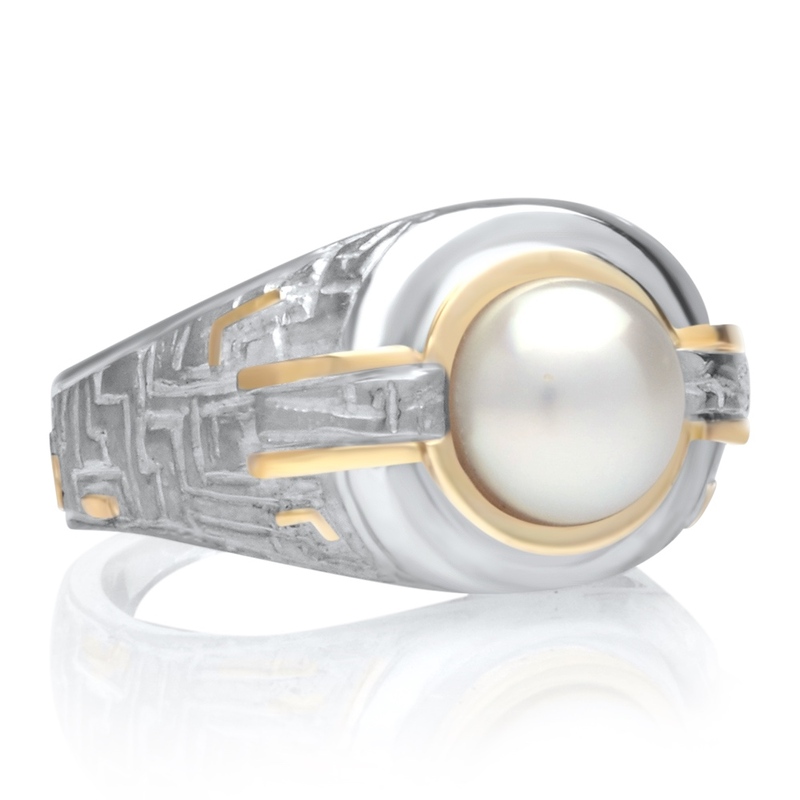 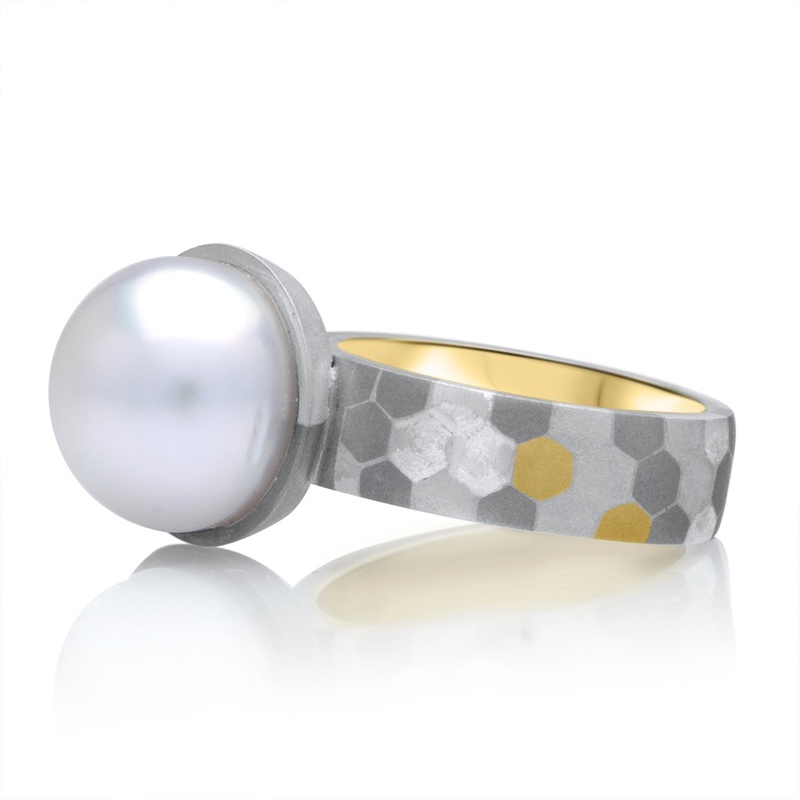 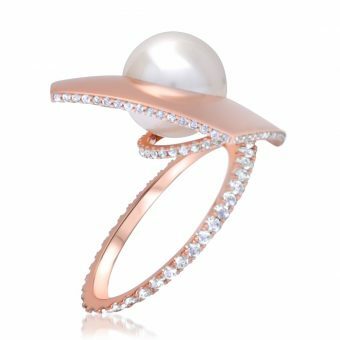 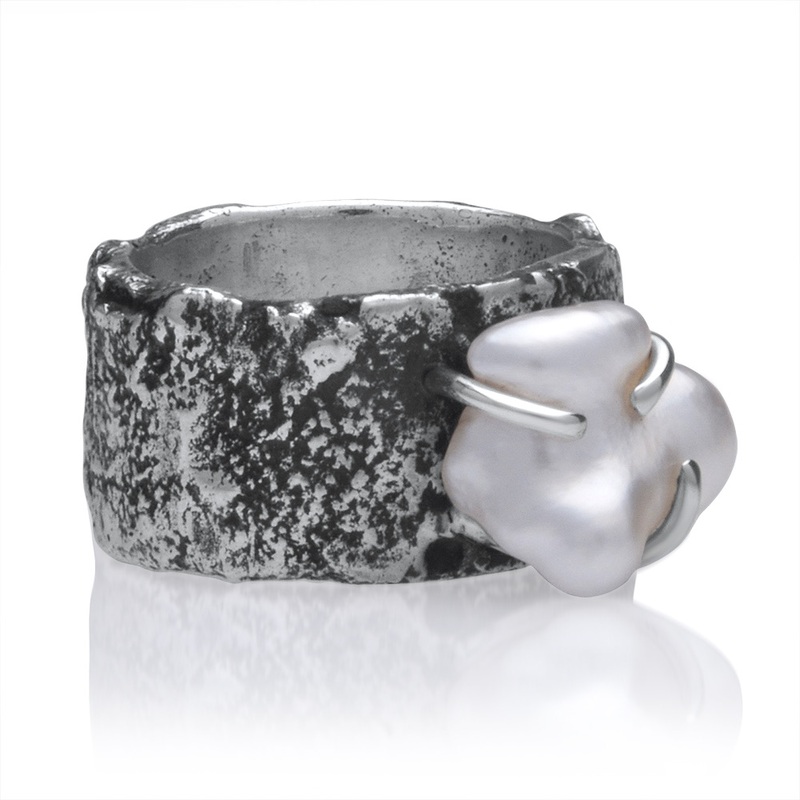 This handmade ring features a Cygnet Bay, South Sea Pearl and an Akoya Pearl. 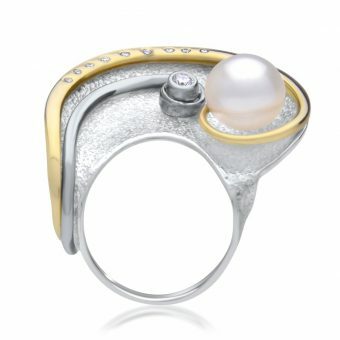 The title has a play on words. Instead of butterflies feeding on nectar, I have worked around the concept of butterflies feeding on nacre for my design. 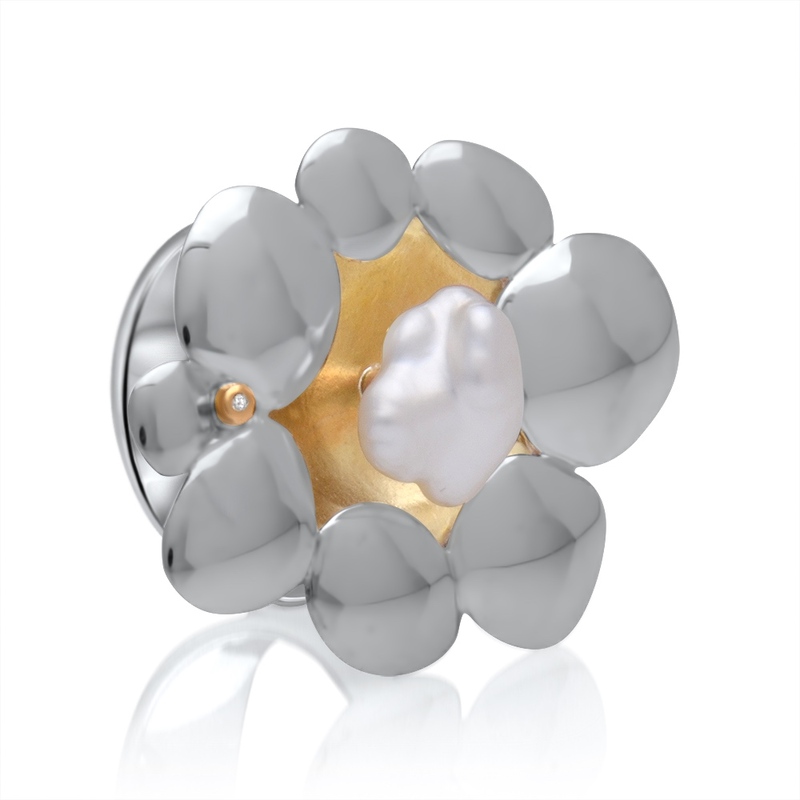 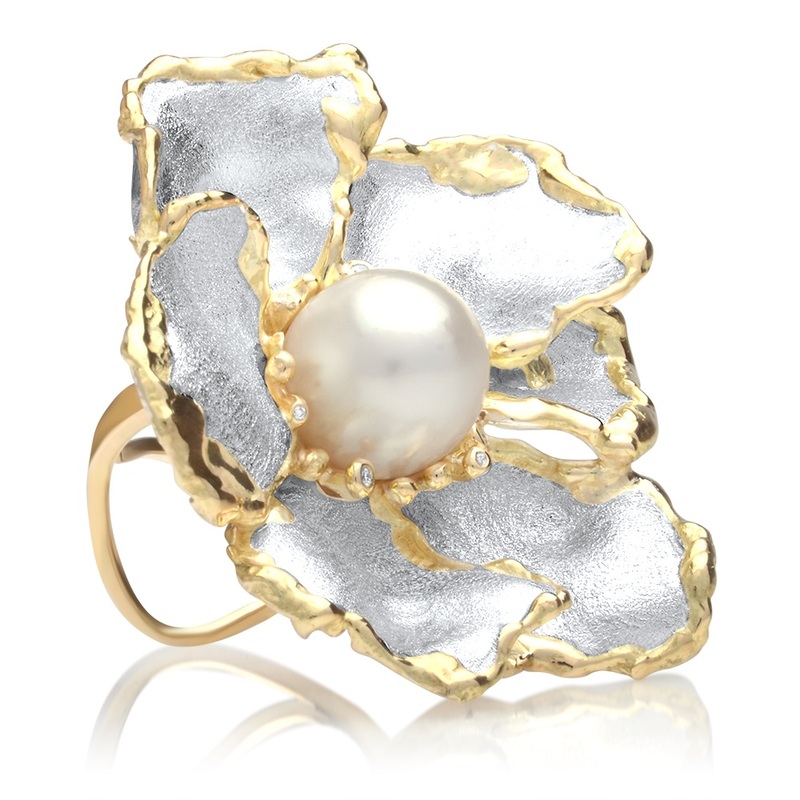 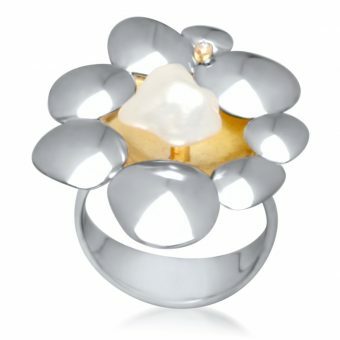 The ring emulates components of a flower and a cluster of butterfly surround the beautiful Akoya Pearl. 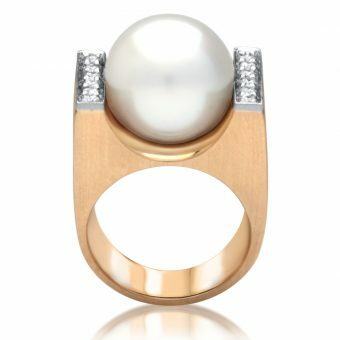 Both pearls are highlighted in this piece. 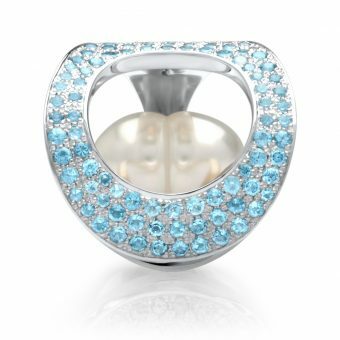 The South Sea for its large size and Lustre and the Akoya for its beauty. 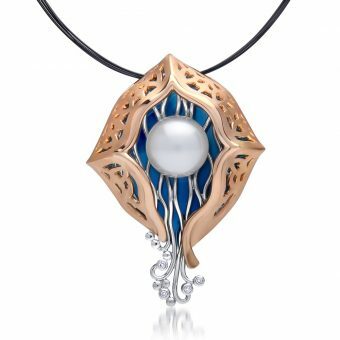 Her story tells the nature of kindness when she saves the life of young mermaid who has ventured too close to the shore, and been washed into the shallow rock pools, stranded to die. When the Princess Centaur who is playfully dancing along the beach sees her stranded, she carries her on her back into deeper waters, and saves her life. 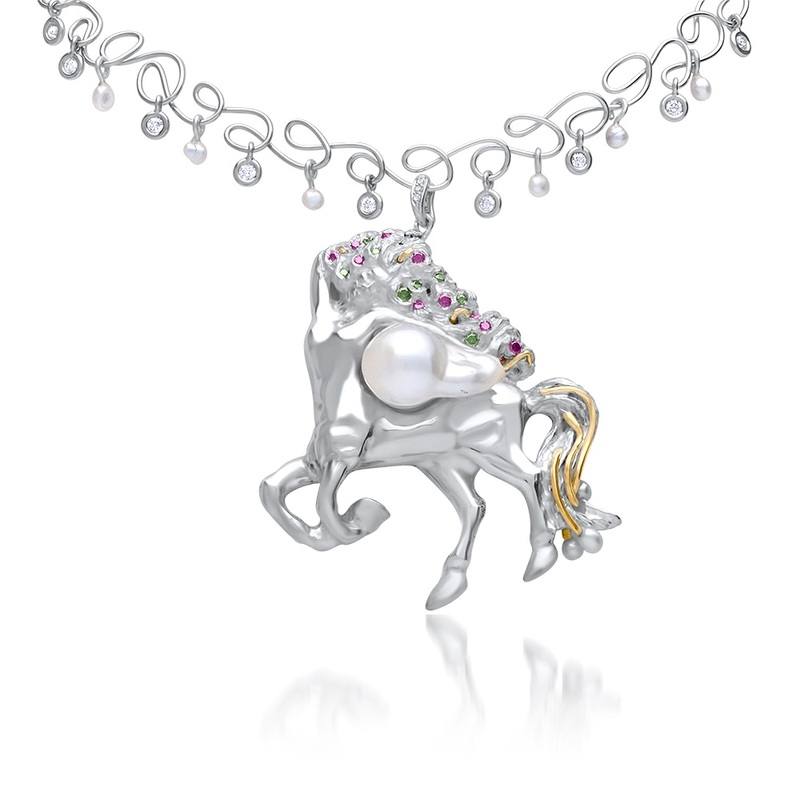 For this bravery she was given a rare pearl, and a legend was born about The Pearl and the Centaur Princess. The pearl represents the setting sun, the diamonds the light sparkling. A modern twist on a classic design. 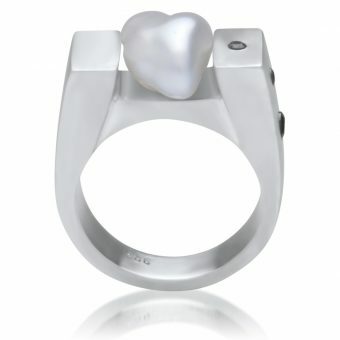 Hearts also feature in the pearl cup. I had a vivid dream about this design, I felt like I had to make it. 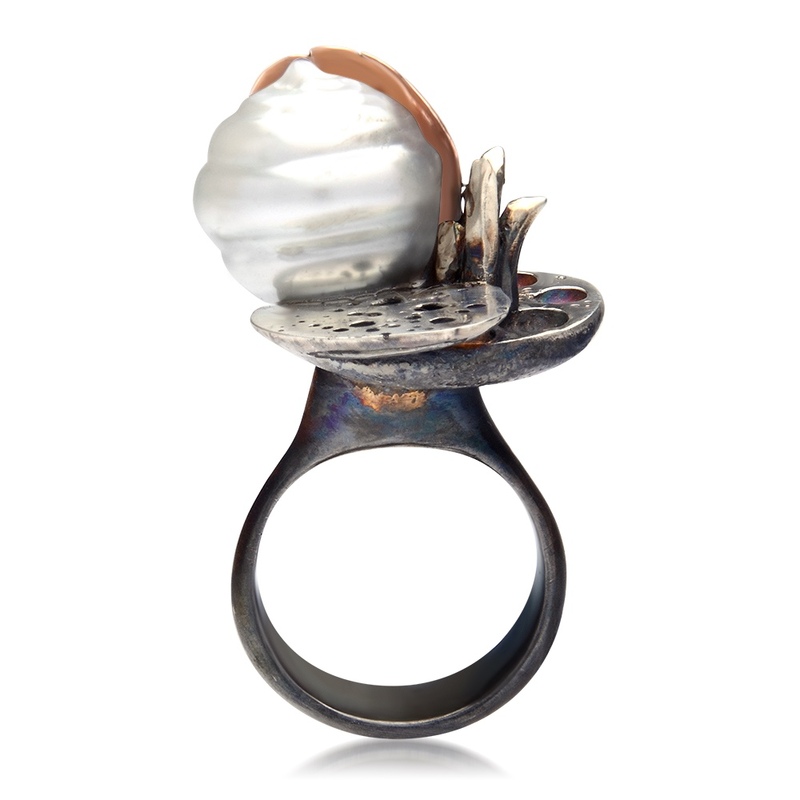 My inspiration comes from my fascination with Cephalopoda, or sea molluscs. In this case, the nautilus, which rises from the depths to feed under the glow of the moon, the twinkle of the starts. 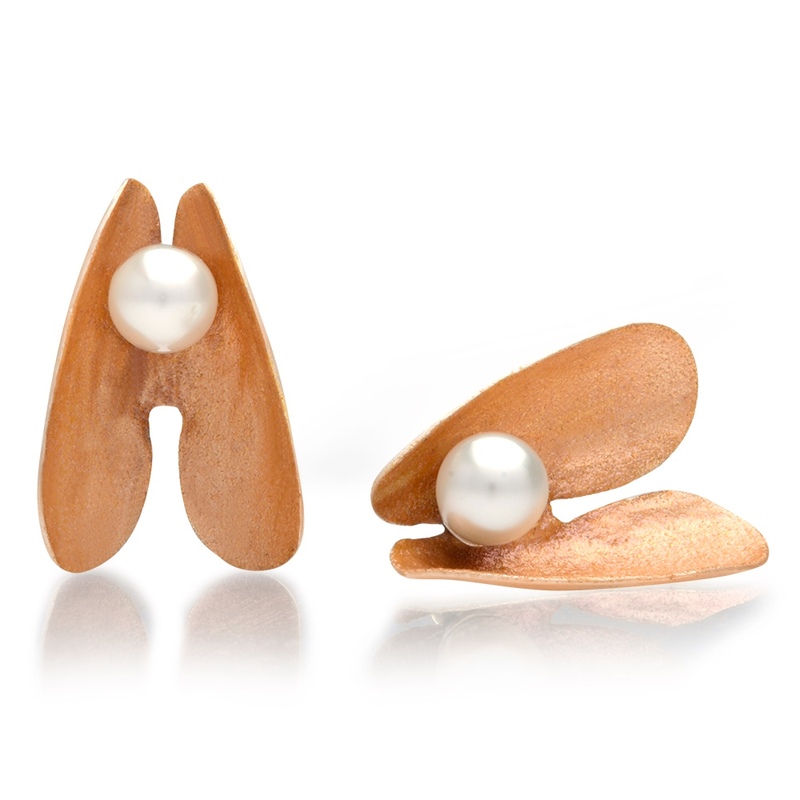 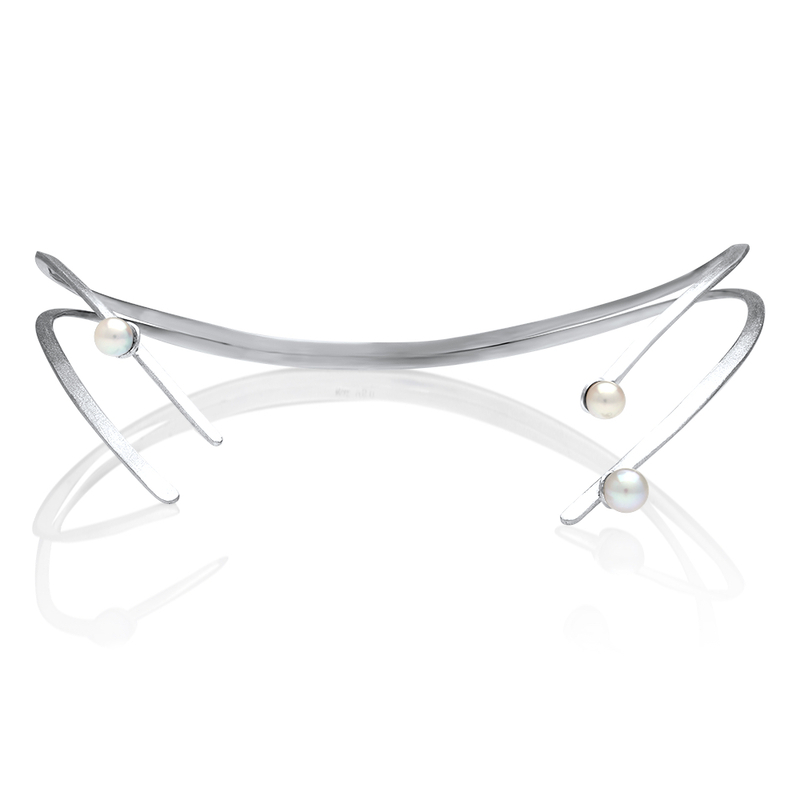 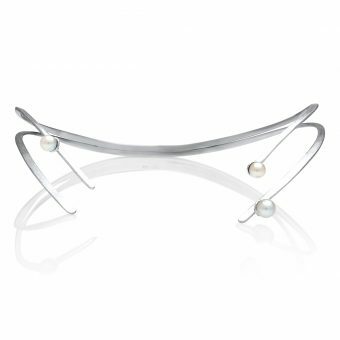 Balance is created by the contrast of the metal against the soft, undulating texture of the pearl. 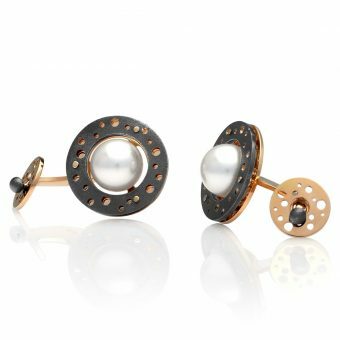 Pearl is the sun setting over the giant tides (scrolls) with the reds (18ct Rose Gold) being the reds of sunset, Sapphires beings tints that occur in the sand at sunset. Engraving on front are Australian grasses. 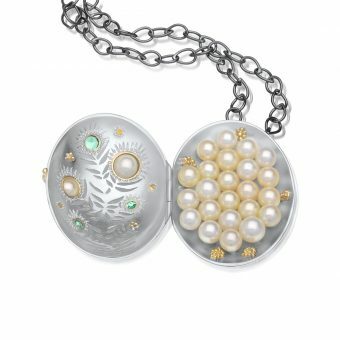 Engraving on back, marine plant life. 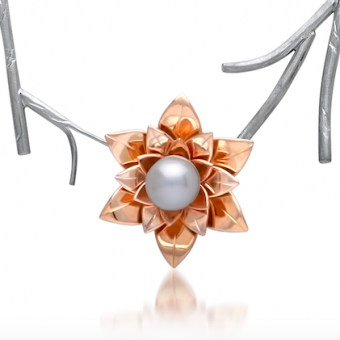 As an artist, when I’m looking for inspiration, exploration is always my starting point. 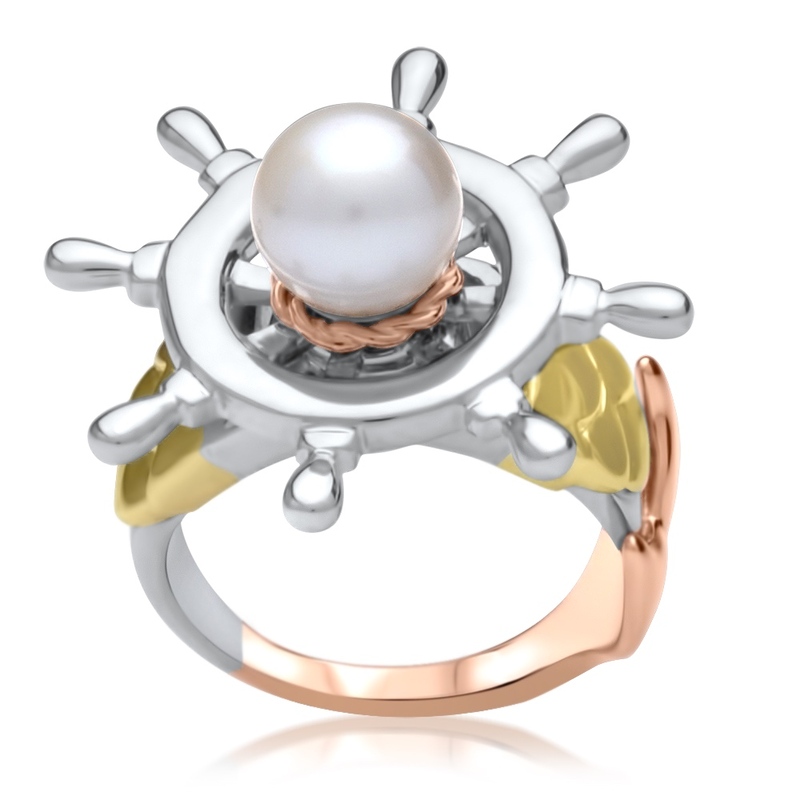 I enjoy the rush of discovery when learning about cultures, history, processes and ideas. 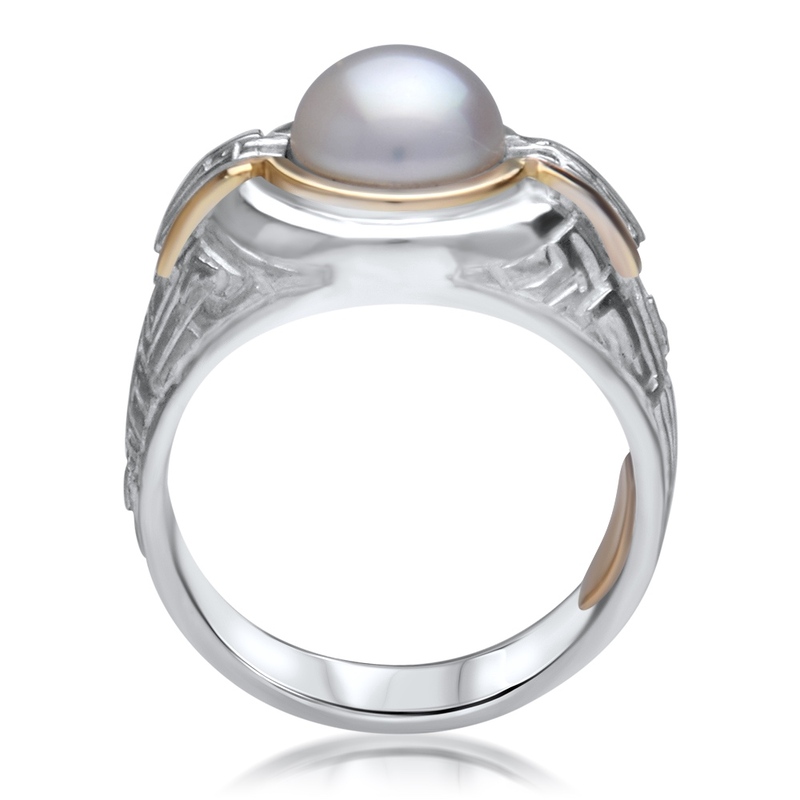 Cygnet Bay Pearls has a history that is intrinsically linked with the Bardi people of Ardyaloon. 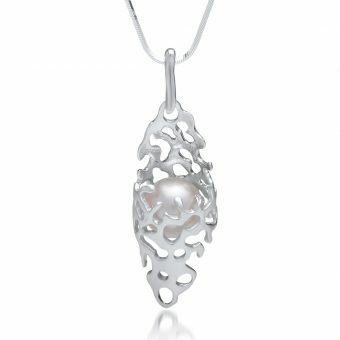 As Australia’s oldest cultured pearling business, the ties with the Bardi have spanned generations and continue today. As an outsider to the pearling industry of Broome, I am inspired by this unique relationship and the cross-cultural understanding and respect that it represents. 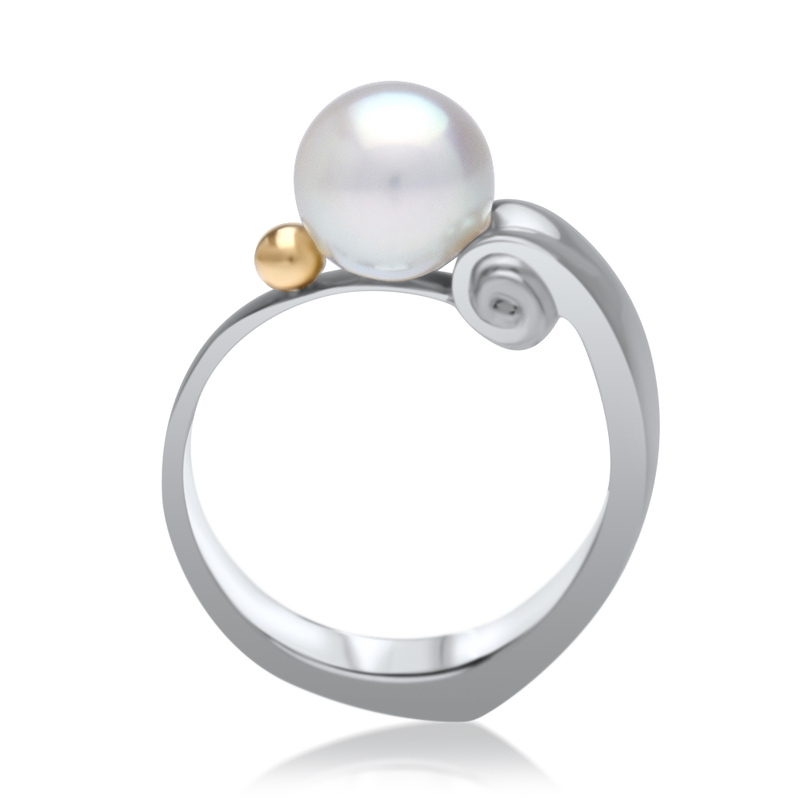 The clear blue water that South Sea Pearls are grown in and the waves that the beaches bring. Cygnet Bay, the marine life, Kimberley area. 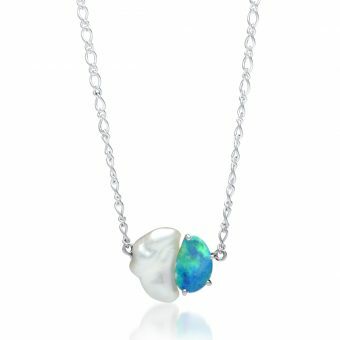 When the ocean and the earth work together to make beauty. 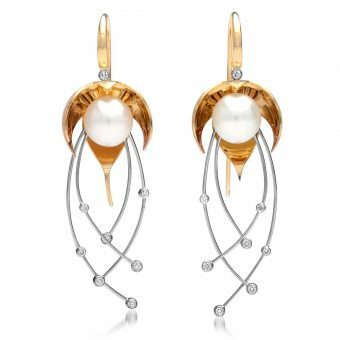 Conceptualizing our collective passion for these undersea treasures, this design dares to capture the poetic vision of a pearl emerging from the depths of the South Sea. 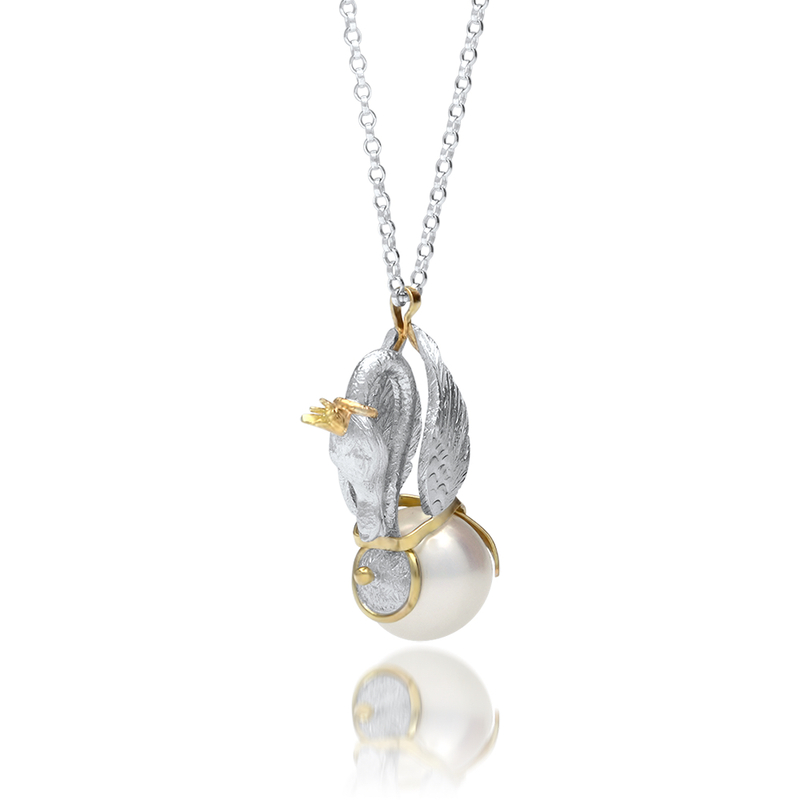 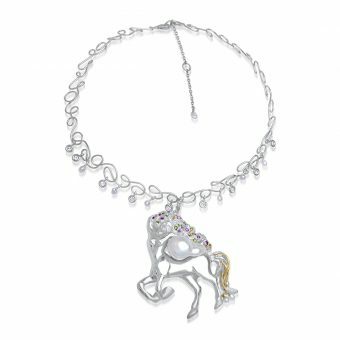 Featuring a stunning Keshi pearl as a mythical Goddess of the Ocean, with a golden aura, escorted by silver bubbles and diamond droplets. Drawing inspiration from the harsh textures and beautiful colours from its oyster namesake, this handmade ring delivers a textured sterling silver cradle edges with two tones of gold, echoing the outer layers of the Pinctada Maxima. This shell shaped piece is designed to follow the contour of the hand with a pearl that splashes out of the design, ready to adorn the South Sea Princess. 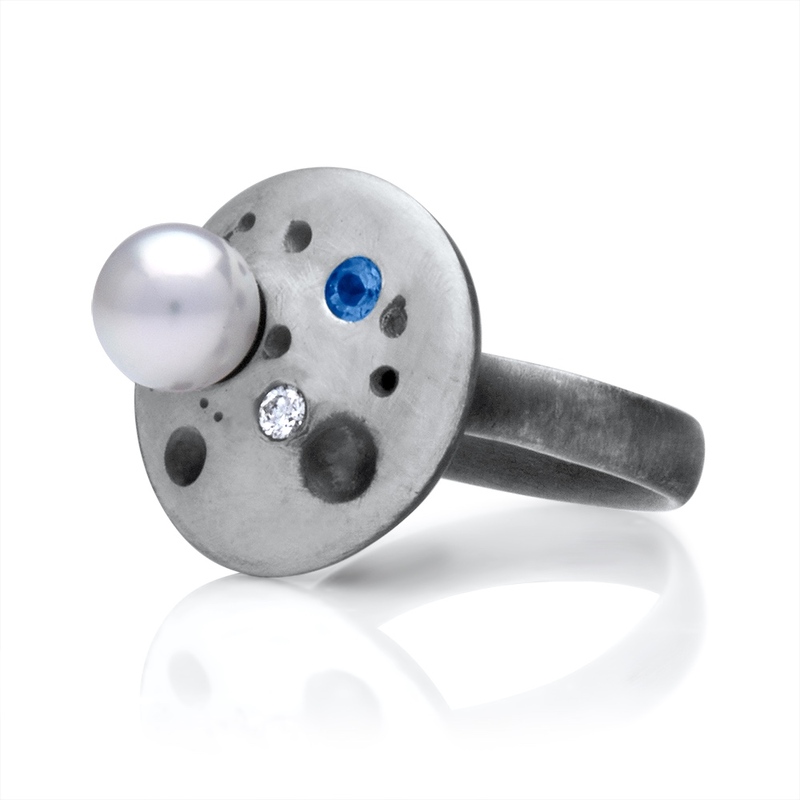 The piece was inspired by my experiences of both snorkelling and beachcombing. I wanted to evoke a sense of floating above and also being immersed in another world. 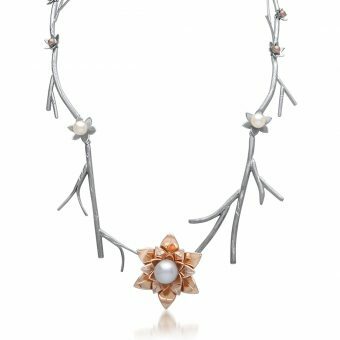 While the piece alludes to various textures and patterns in that world: coral, sand, driftwood, seaweed, pebbles etc., it’s not meant to be representational of any specific one. My inspiration is from my mothers love of anything autumn tones or colours. 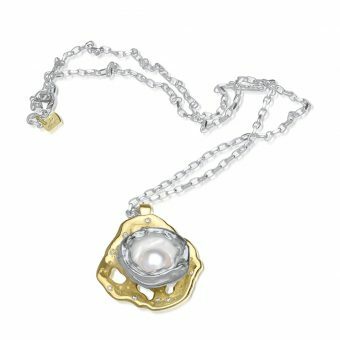 Ma is a Japanese word to describe the concept/idea that empty space/time can also be as significant as the object/time surrounding it. I wanted to create a ring with this concept of the negative space of the ring is the integral part of the ring itself. 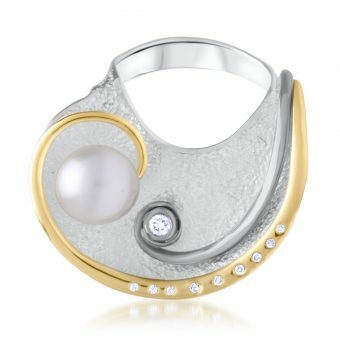 The ease and natural birth of my child, a piece created so naturally and beautifully, like the pearl. 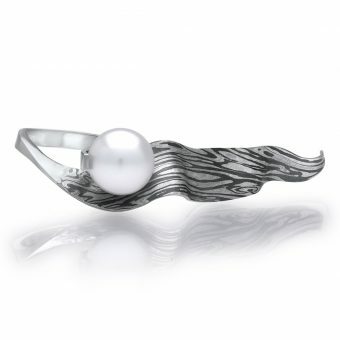 Riding the wave of life’s ups and downs. 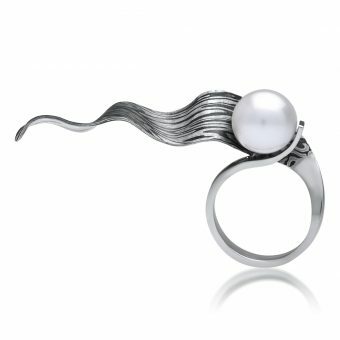 APPRENTICE/HANDMADE: Sterling Silver with Cygnet Bay, South Sea Round Pearl 13mm B1. APPRENTICE HANDMADE: Sterling Silver with Cygnet Bay, South Sea Round Pearl 13mm B1+. 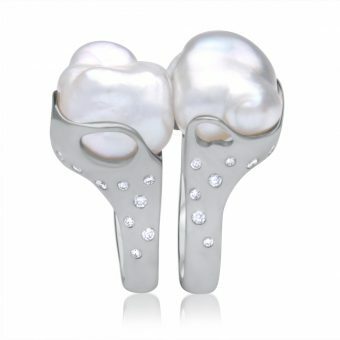 Upon receiving these pearls, I noticed they fit together. 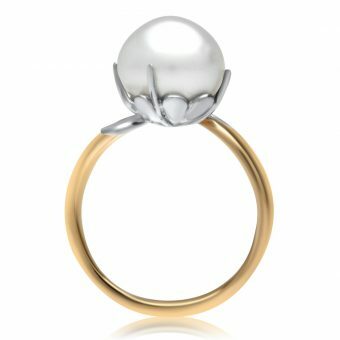 Just a kiss. A motivating coincidence that needed to be highlighted and utilised. “Kissing Keshi’s” is a ring set that can be stacked and worn by one person. 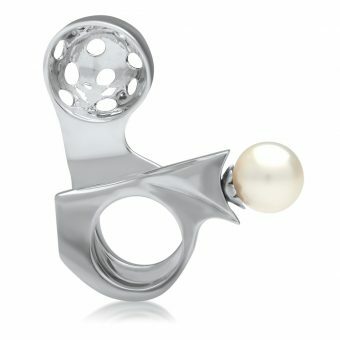 It was however, designed to be shared. 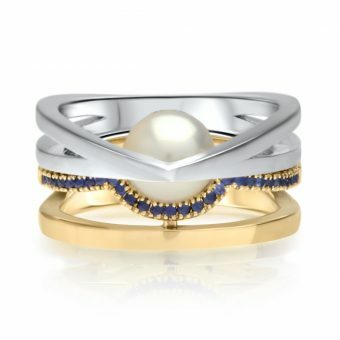 Between two people. Partners, parent and a child, siblings or even best friends. 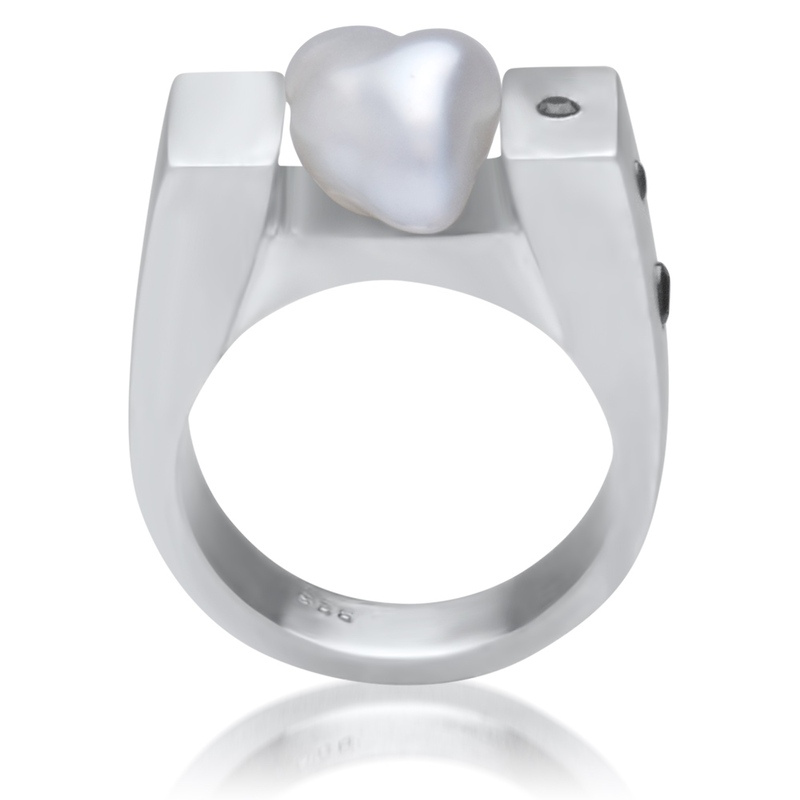 As a symbol of the love they share for each other. This kinetic handmade ring is inspired by the mythology of mermaids and sirens luring sailing ships and their crews to their impending doom. 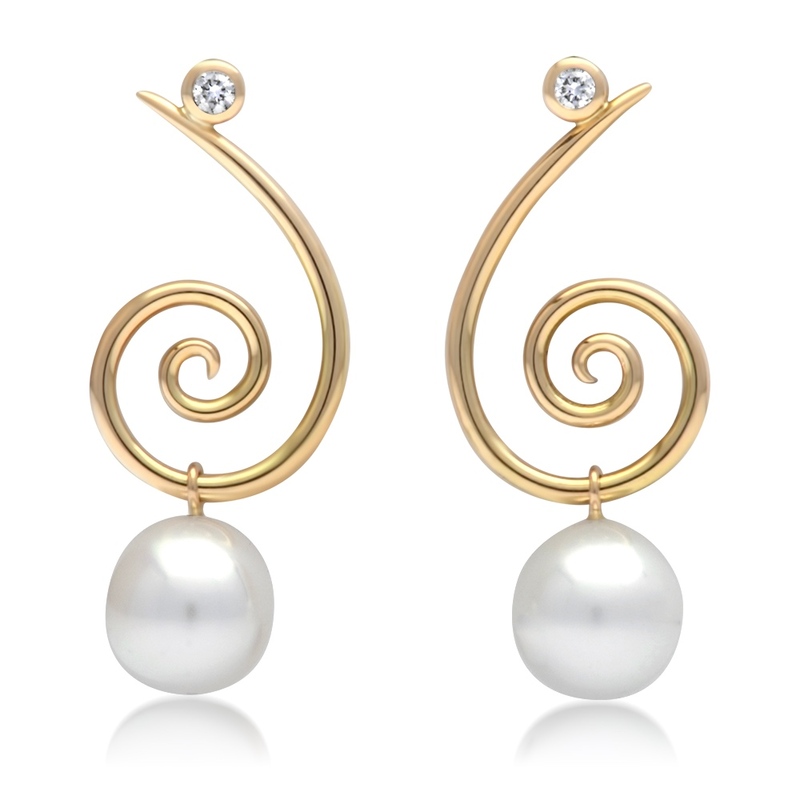 In various folklores, it is said that mermaids have the ability to cry tears of pearls. 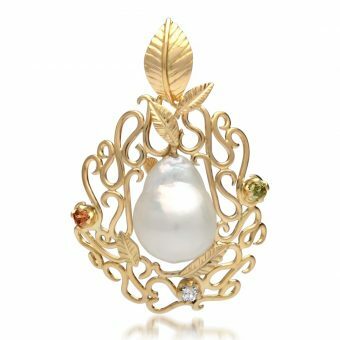 Others regale stories of humans being rewarded with treasure for an act of kindness towards a mermaid. Inspired by the slow degradation of sunken ruins. 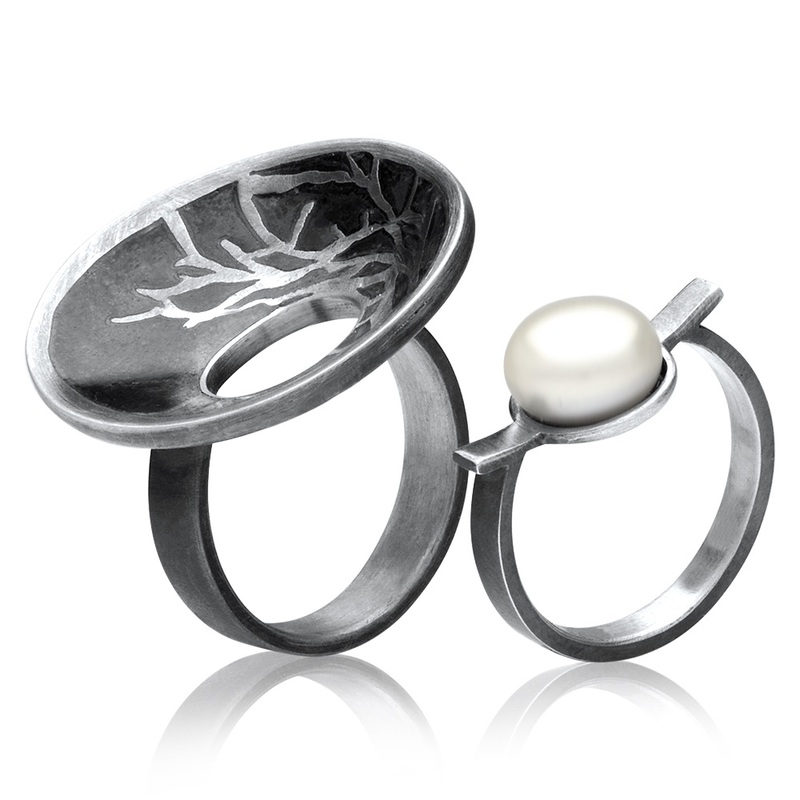 A celebration of the sun and the sea of a place I call home, the West coast of Australia. 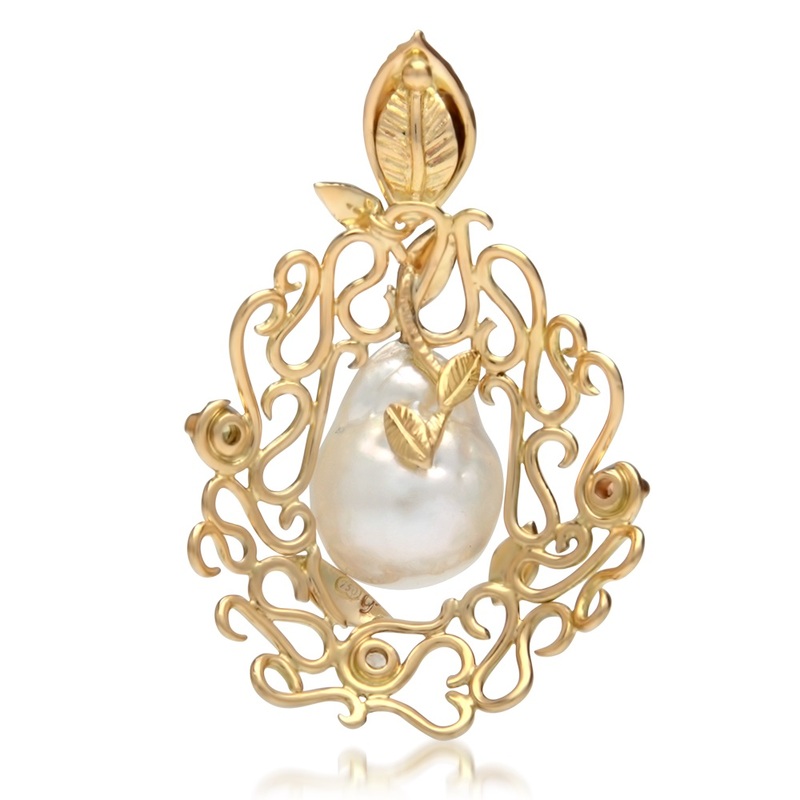 My inspiration was to create a blooming pearl, because I believe that pearls are the flowers of the sea. 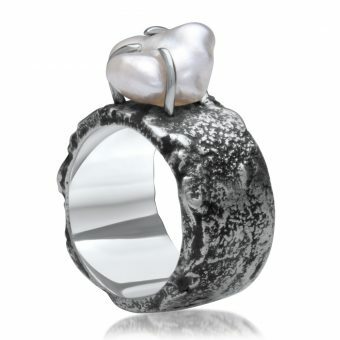 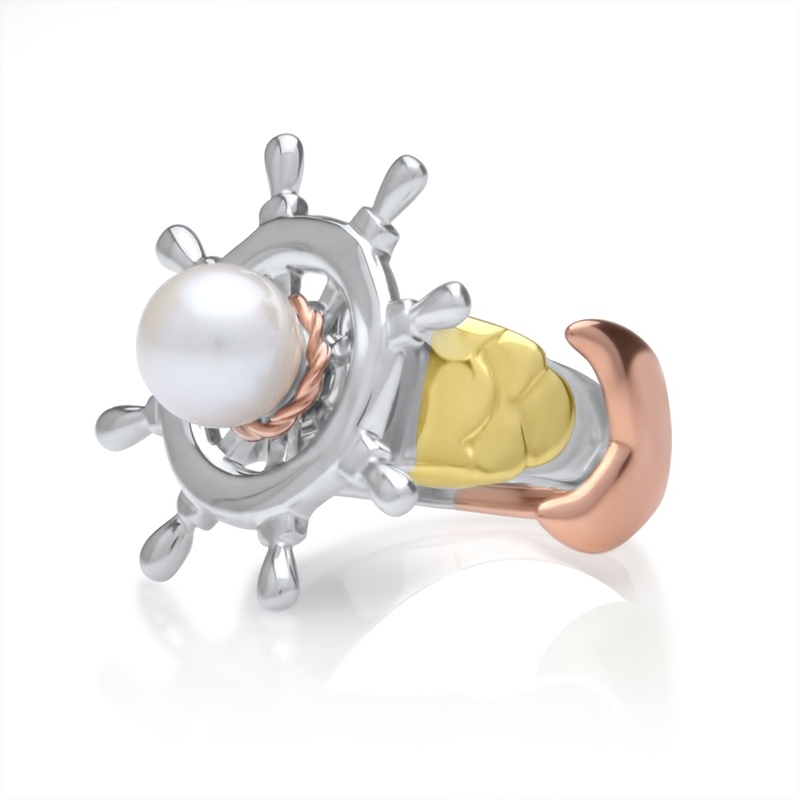 The stereotype of what a man is supposed to be is challenged in my design of this ring aptly called ‘Man’. 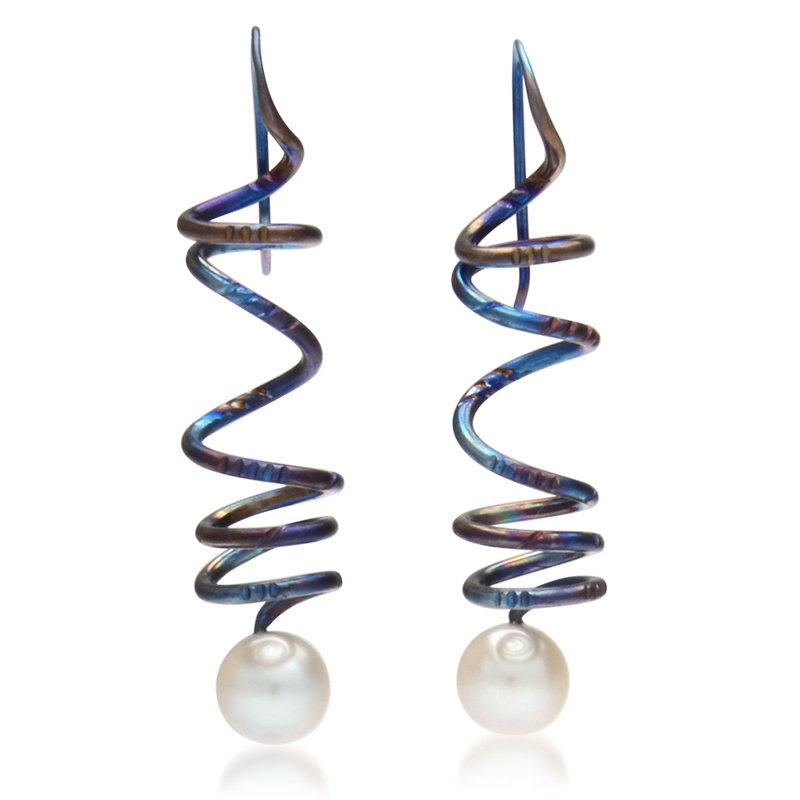 It’s a fact that men have both the male and female chromosome. And men can be strong and hard; and yet gentle. 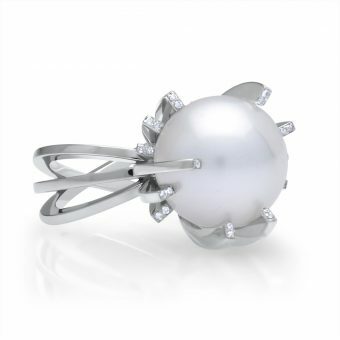 The ‘Man Ring’ design reflects these traits with its robust and solid structured form and the use of a delicate and fluid Keshi pearl as the centrepiece. 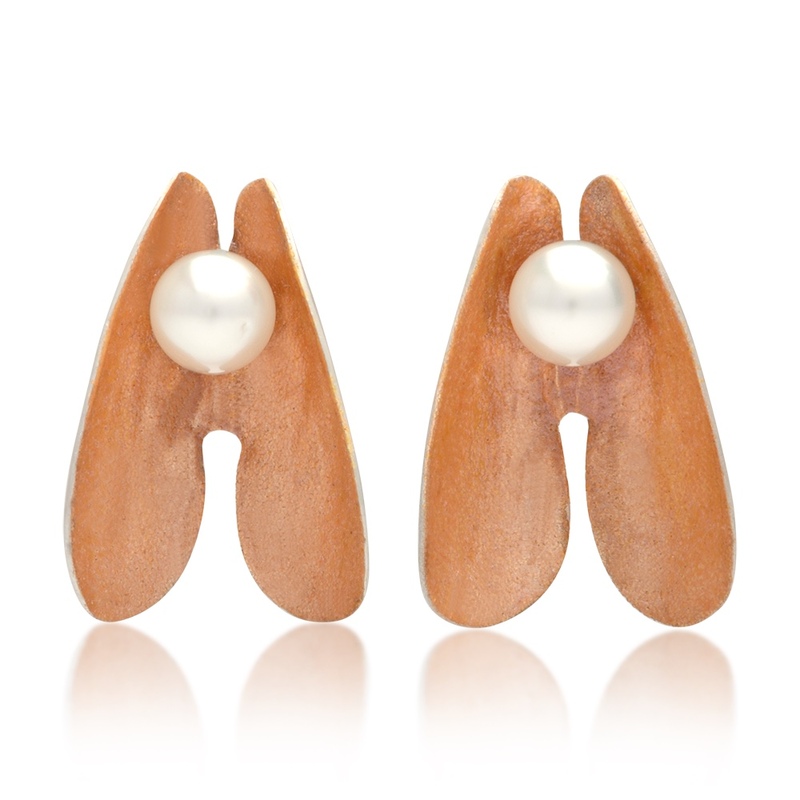 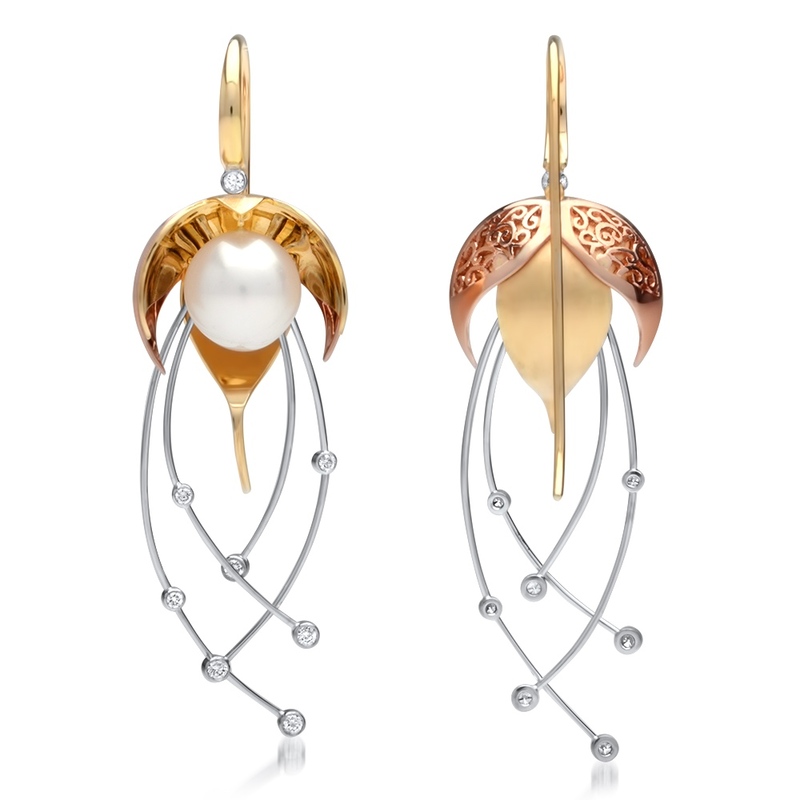 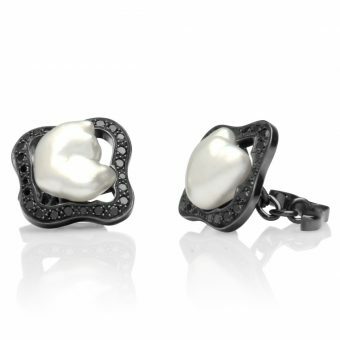 Keshi pearls, which are ever so different from one to the next, represents individuality. 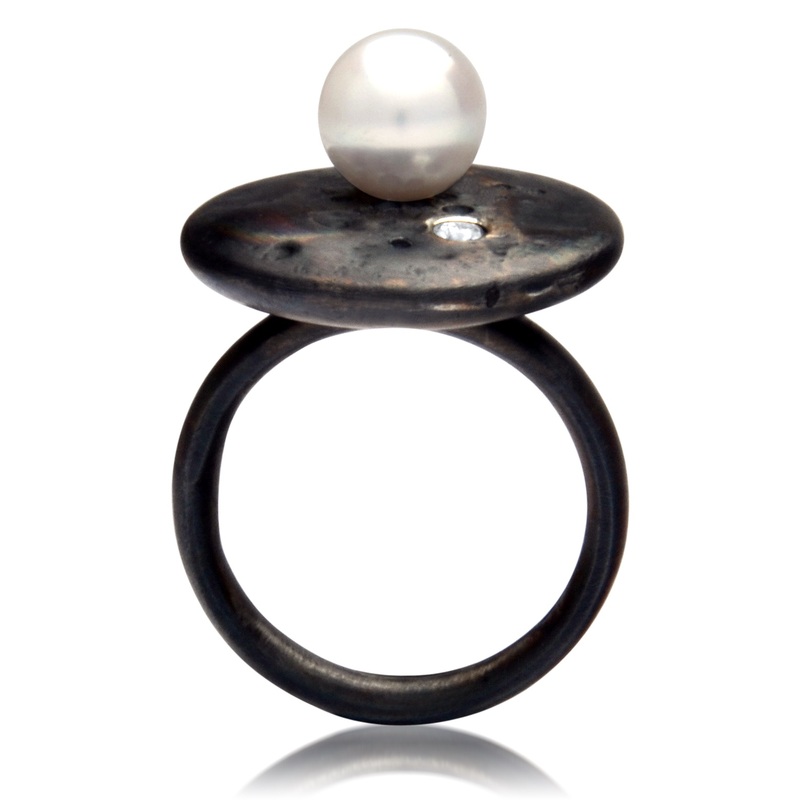 Little black spinel rounds add the finishing touch to lend an elegant black tie feel and look to the ring. 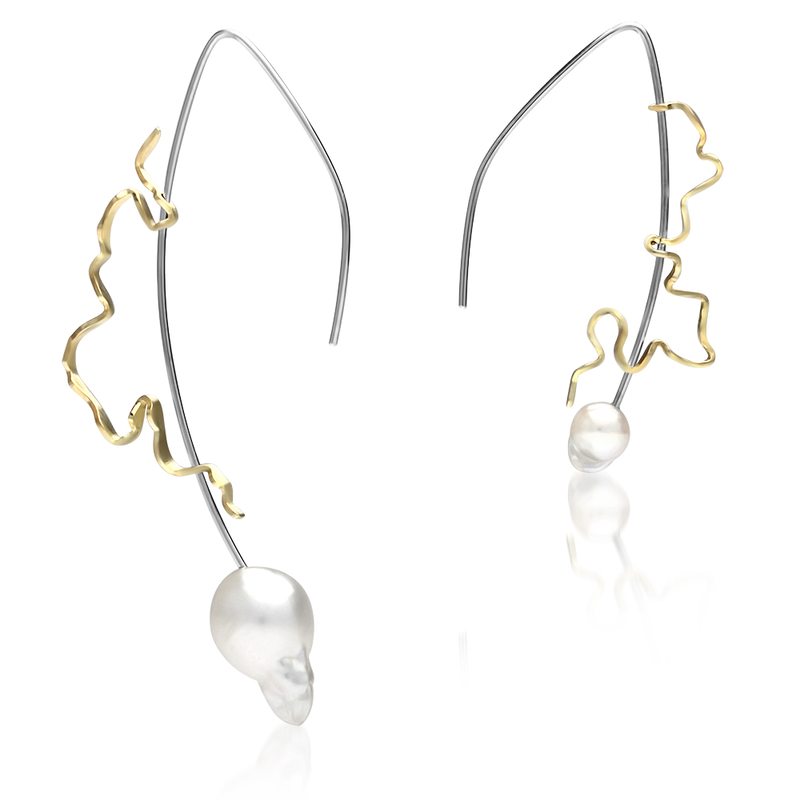 Full moon rising behind silhouetted trees. 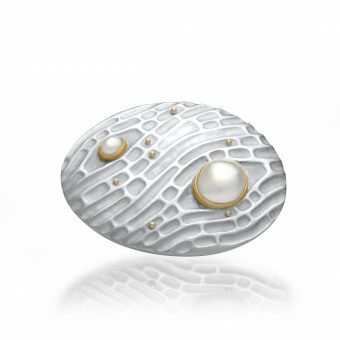 The egg-shaped pearl inspired the Faberge-esque design. 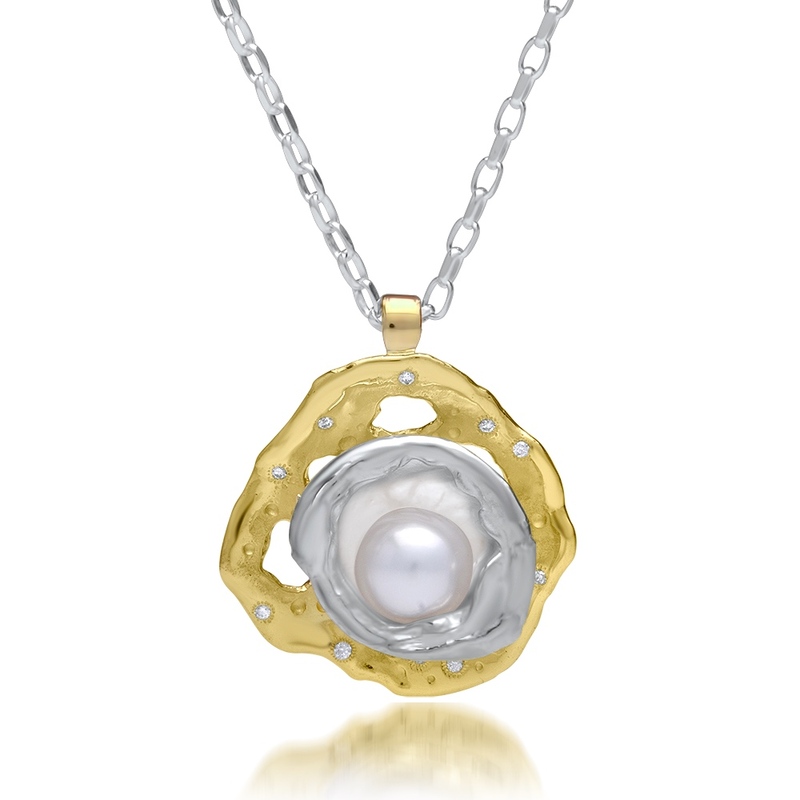 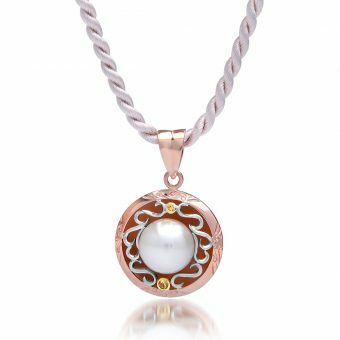 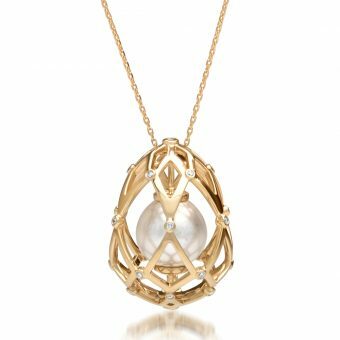 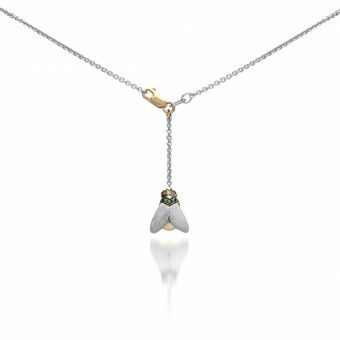 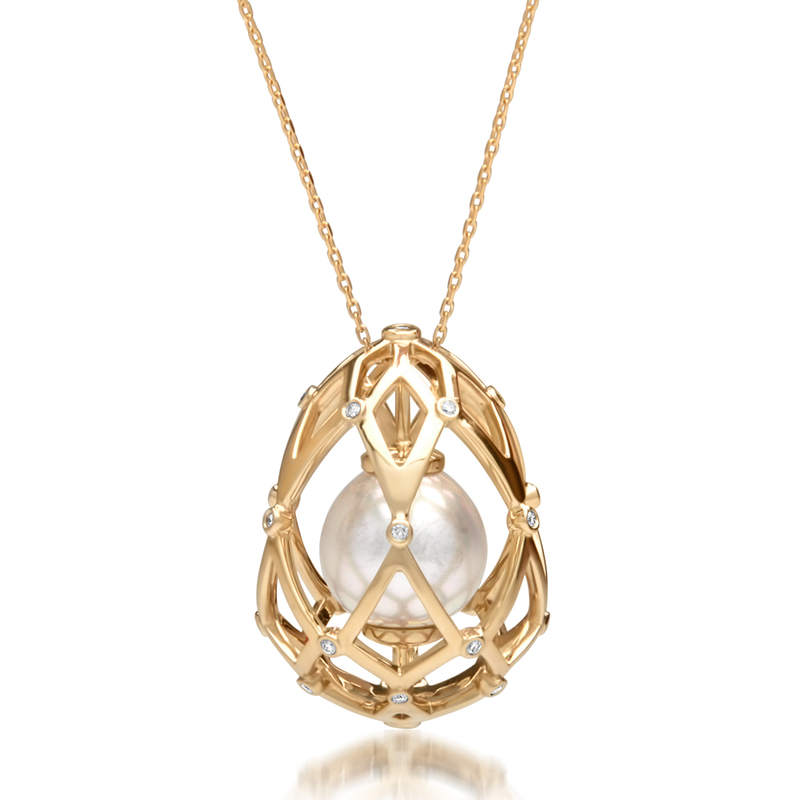 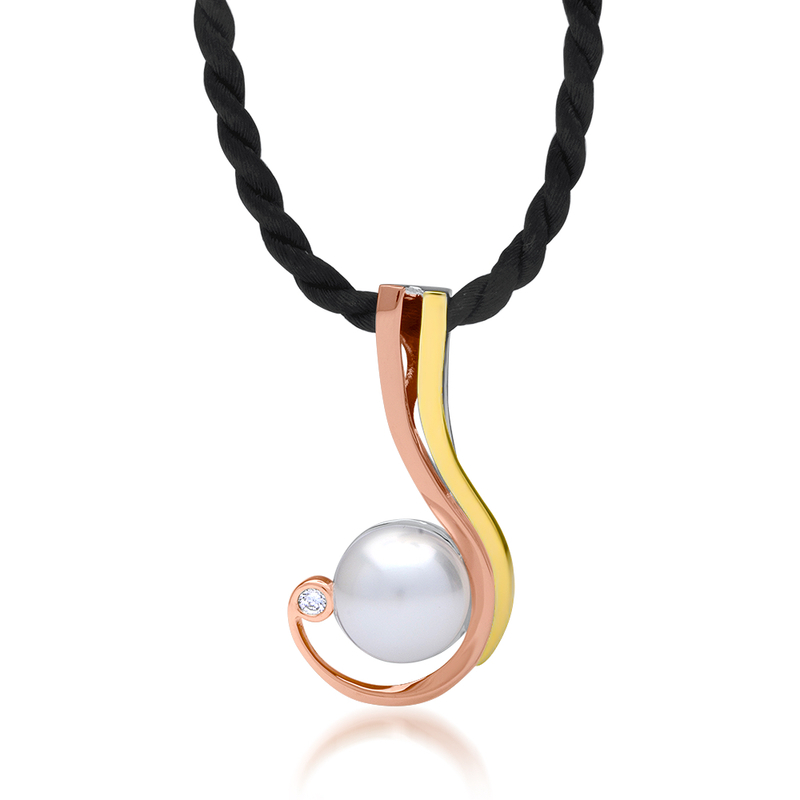 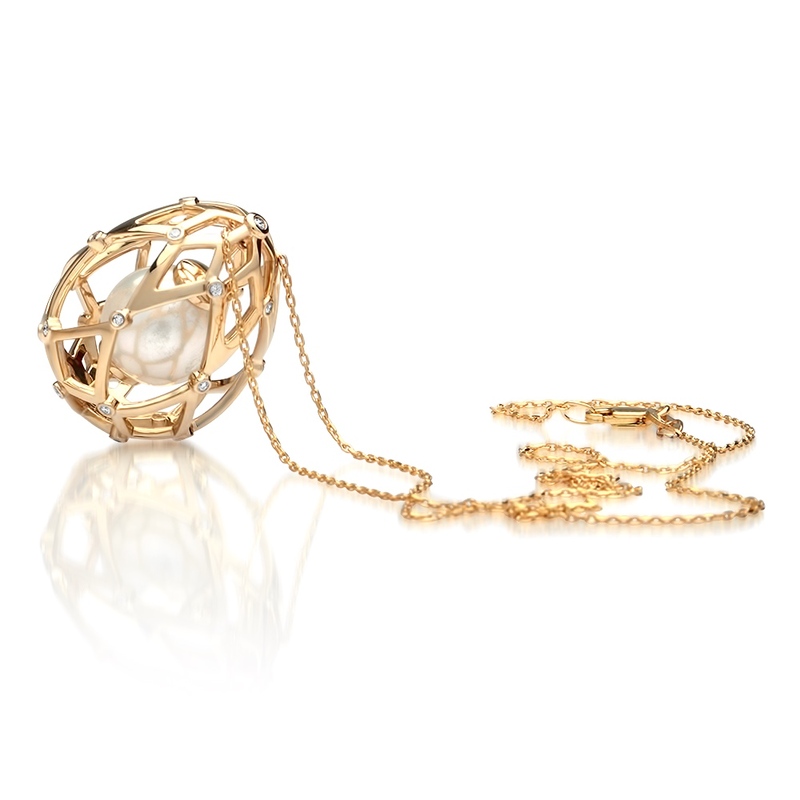 The precious pearl represents the yolk, suspended inside protected by the shell made of gold and diamonds. The pearl I chose had some beautiful characteristics on its surface. I designed a cage so there was no need to drill or damage the pearl keeping it in the purest form. Geometric lines and shapes seen in aboriginal art. Whiteness of the pearl. An expression of joy and love for my daughter and the beauty I see as she grows. 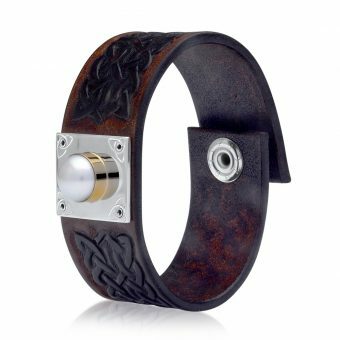 When I saw this new category I immediately knew I wanted to create a man’s bracelet. 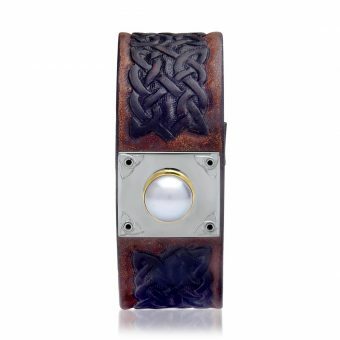 I was inspired to use leather, hand tooled with a Celtic knot pattern. 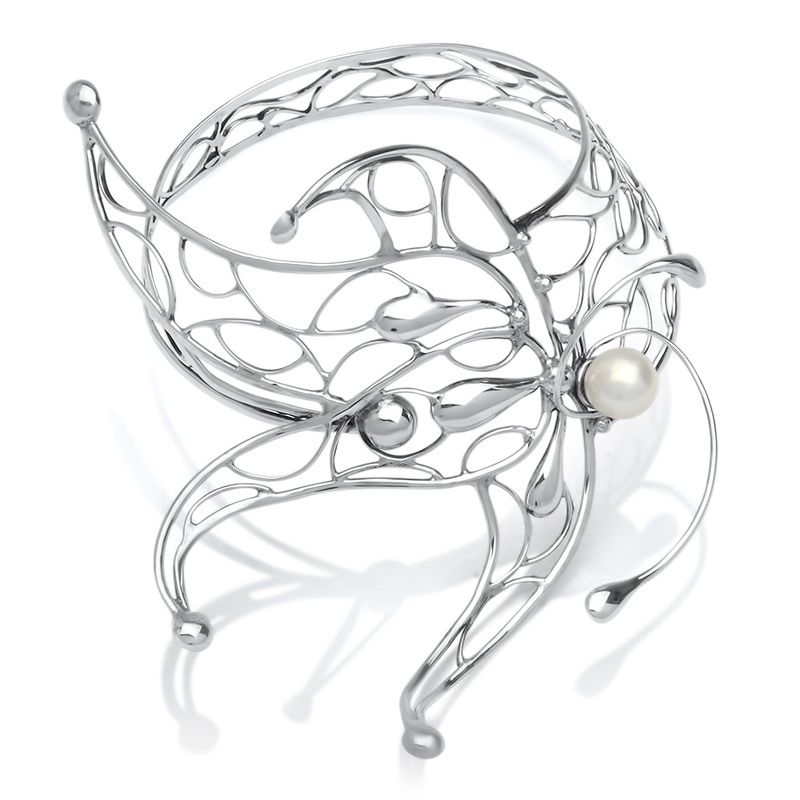 Celtic knots are a series of overlapping or interwoven knots which have no clear start or end. 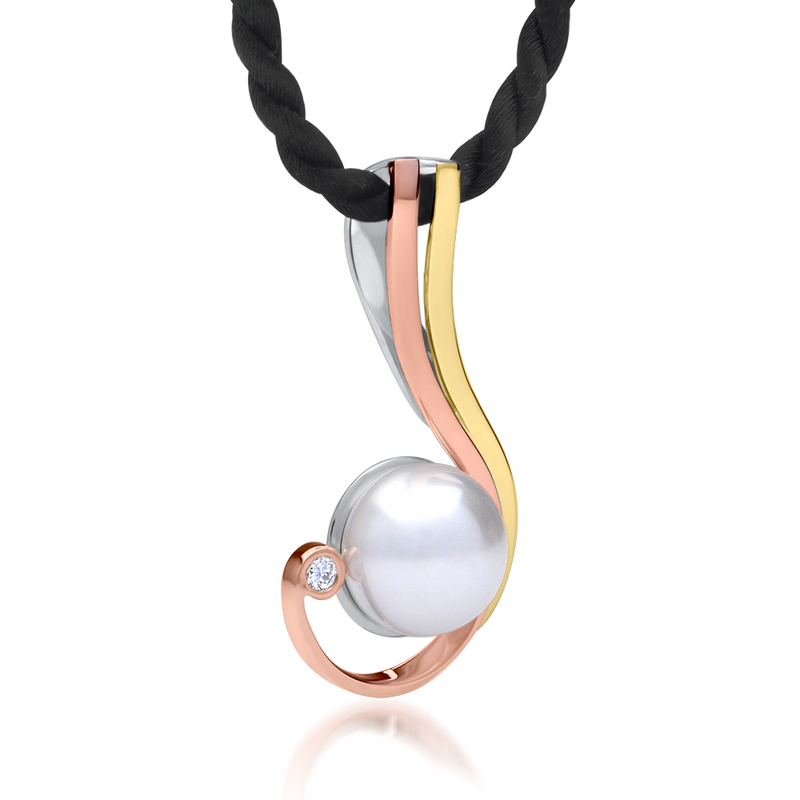 I have designed the piece to be elegant yet masculine, sturdy and wearable. The centre plate is sterling silver with four tiny rivets holding it to the leather band. 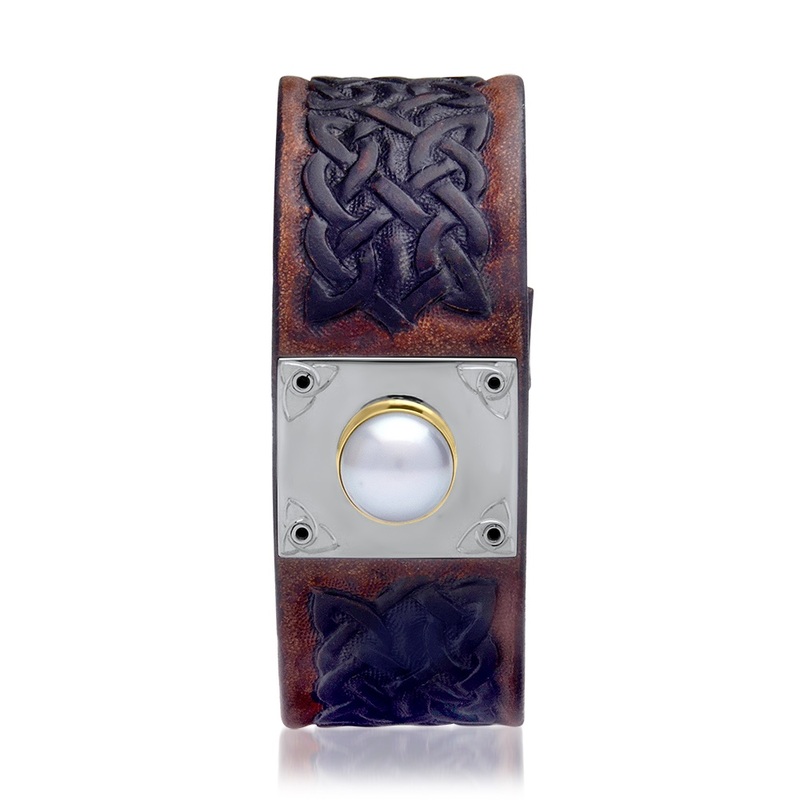 These rivets have been engraved in the same Celtic knot pattern as the hand tooled leather band. 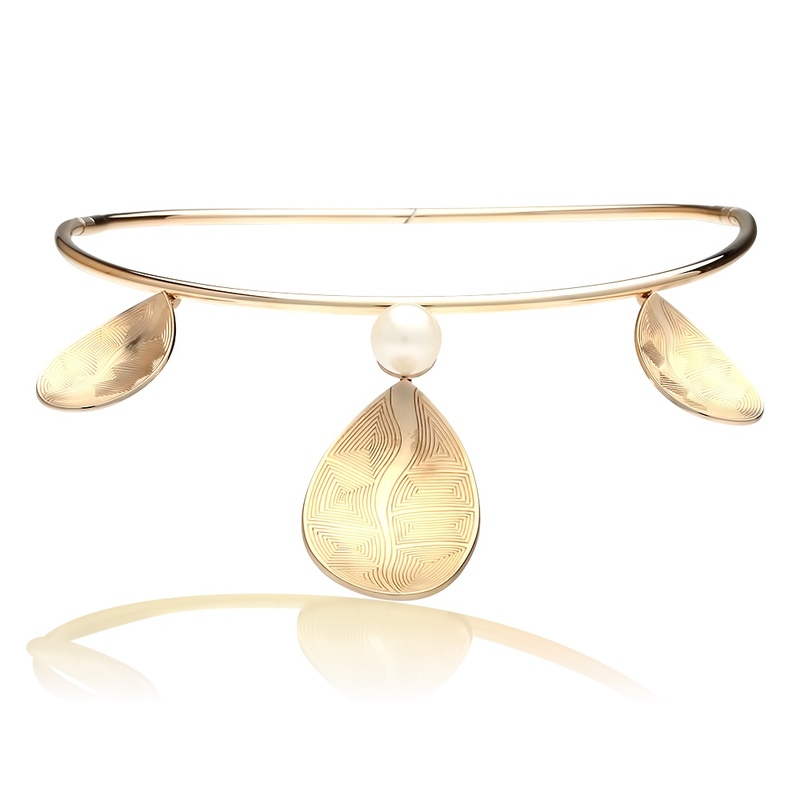 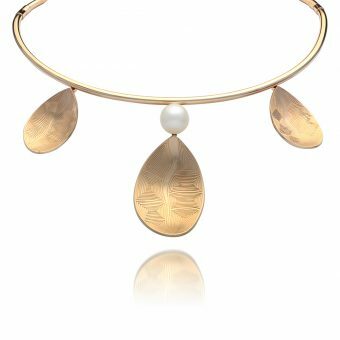 The 18ct Gold bezel enhances the lustre of the exquisite Cygnet Bay Pearl, which is the focal point of the bracelet. The snap closure provides easy wearability. 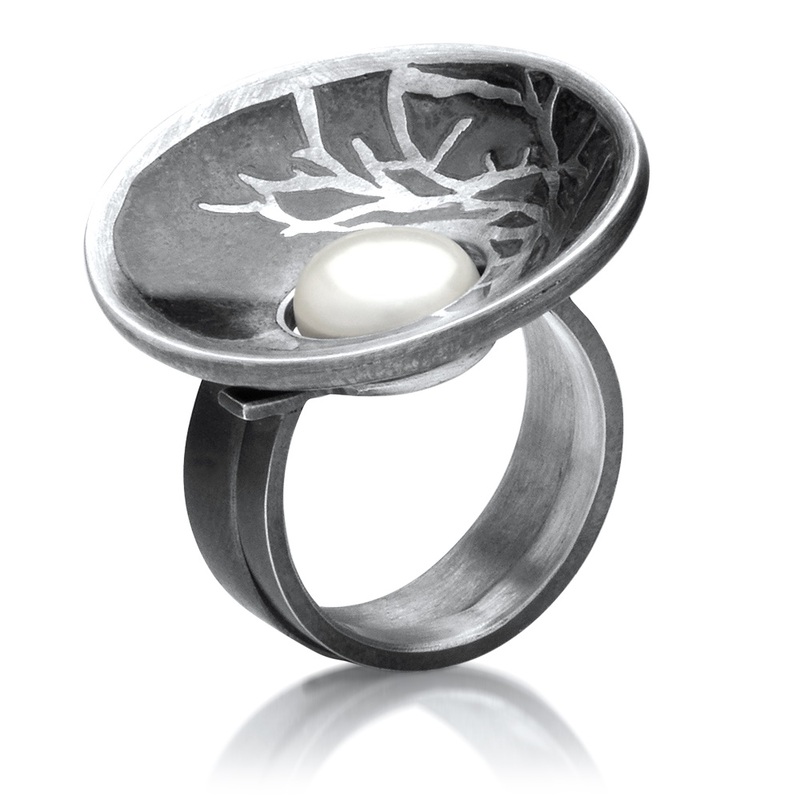 When designing jeweller pieces I will aim for movement, fine lines and showcasing the beauty and process of nature. 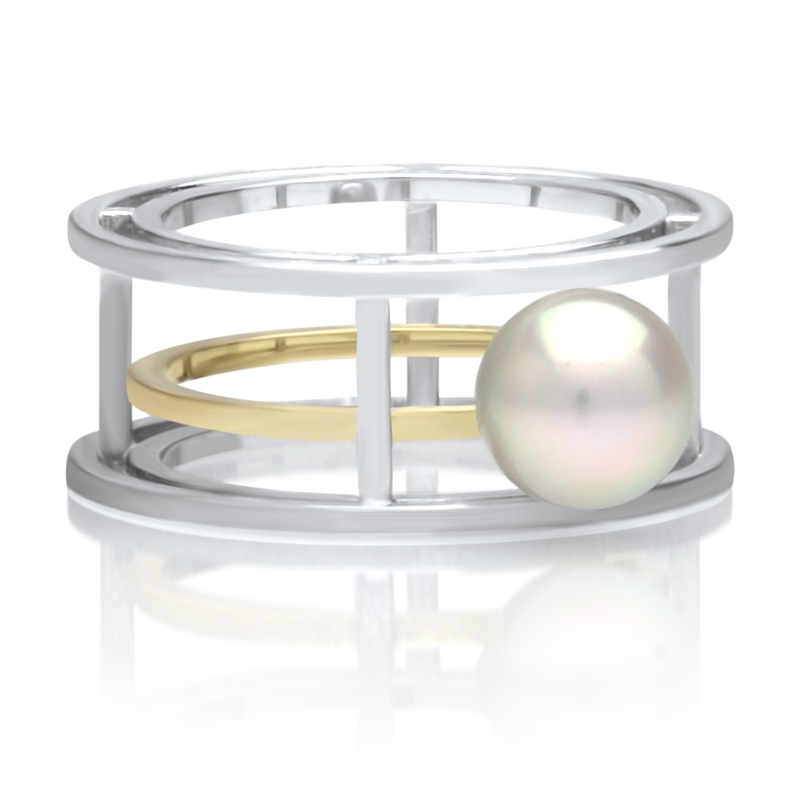 “Tidal” is a two piece ring set inspired by the concept of connecting the wearer with the Broken Bay Akoya pearl and the natural processes/elements involved in her creation. 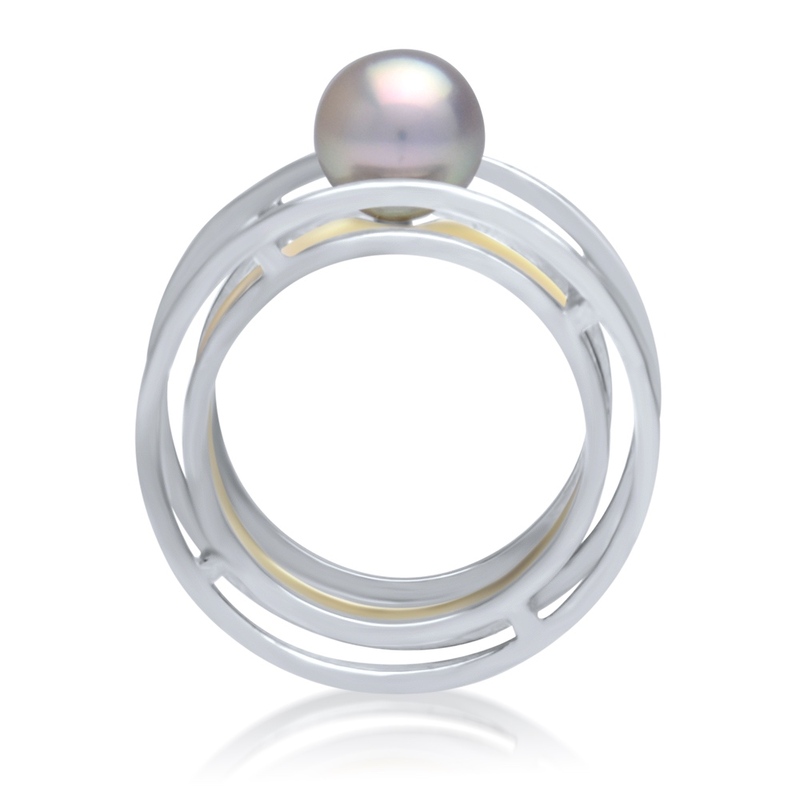 The feature ring is 9ct White Gold and showcases a 7mm Broken Bay Akoya pearl set in such a way as to contact the skin and hence directly engage the wearer with this natural gem. The pearl in this piece also represents the moon which affects the tides throughout its formation. 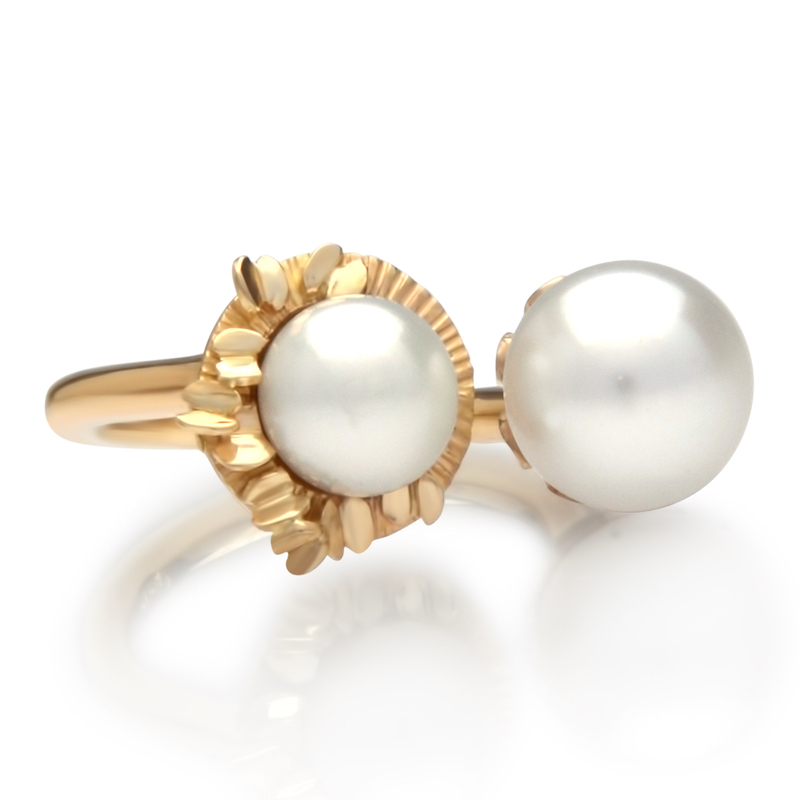 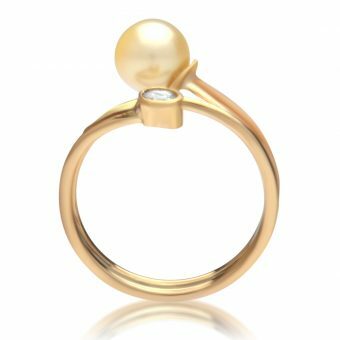 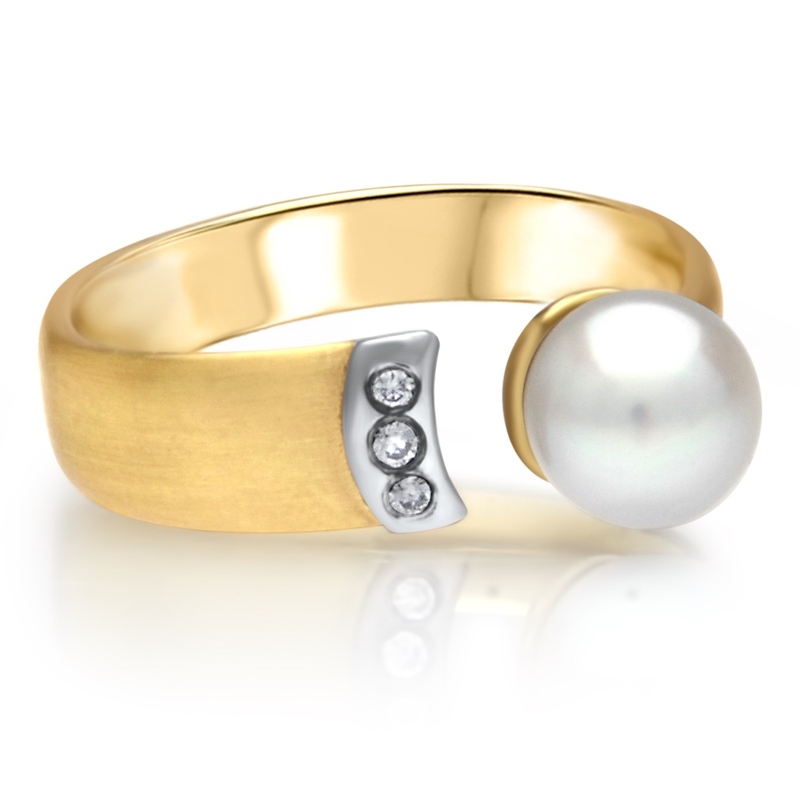 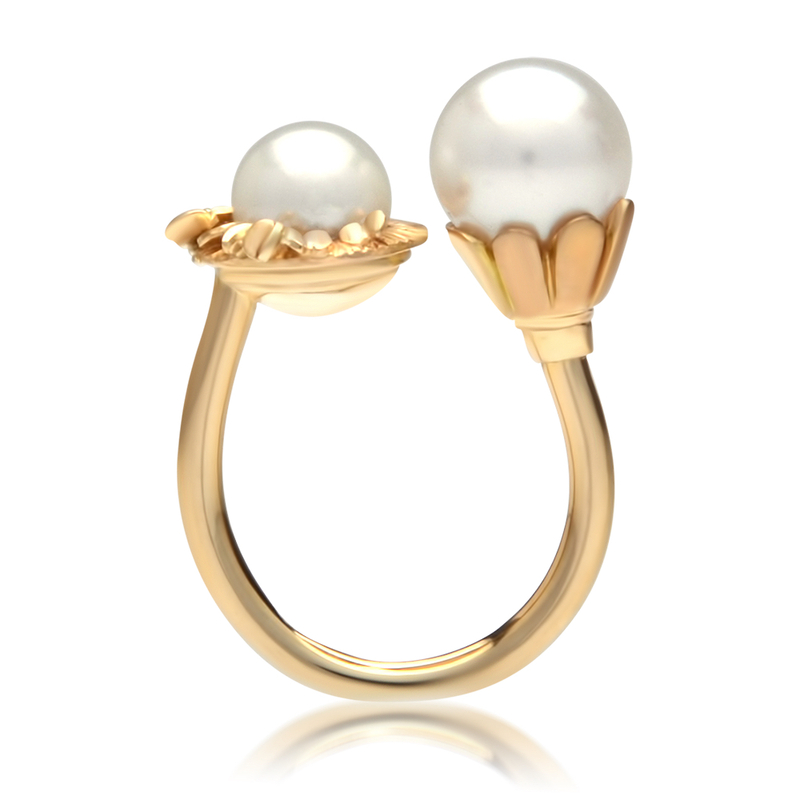 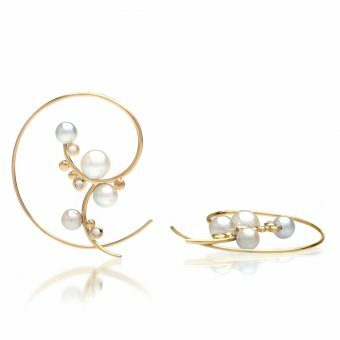 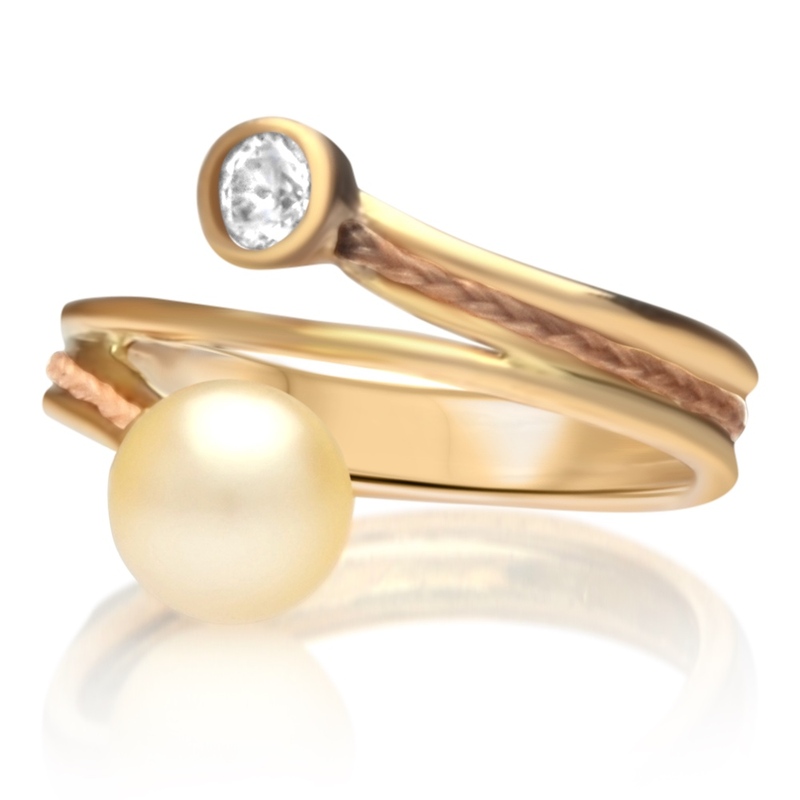 The second ring of the set, a split 9ct Yellow Gold piece, completes the set, in its representation of the ocean where the pearl was birthed. 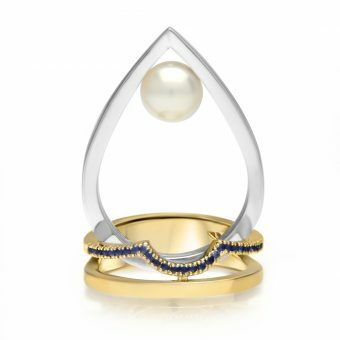 The wave shaped band with its gradient of blue sapphires which lighten in colour to their peaks echo the water and waves of the ocean, whilst the 9ct Yellow Gold of this band mirrors the sand of Broken Bay where this pearl is cultured and farmed. 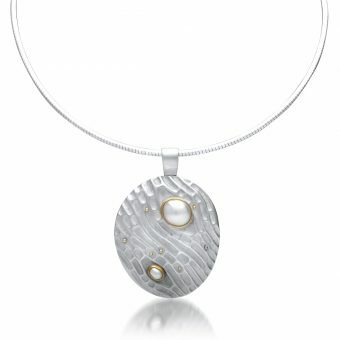 The coast lines of Cygnet Bay and Broken Bay. 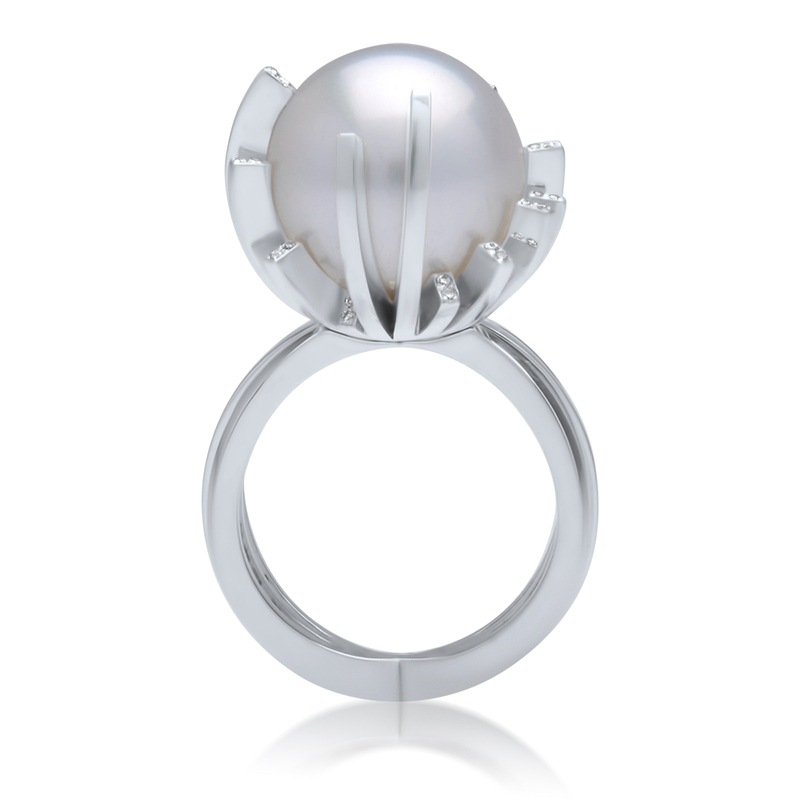 The Cygnet Bay Pearl demonstrates a fully mature pearl which has a rich history and value. 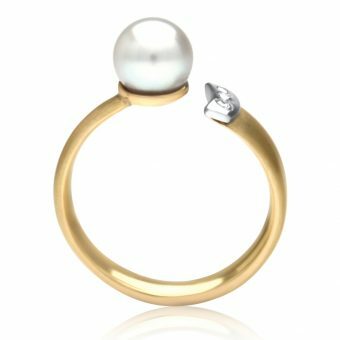 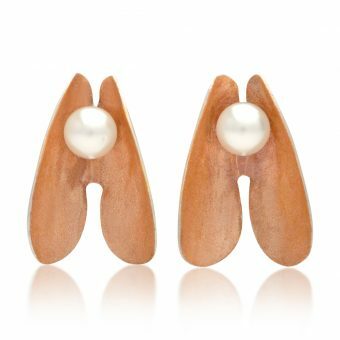 The akoya from Broken Bay is a much newer Australian pearl industry and looks to the South Sea Pearl with the hope and admiration of a young girl … beautiful women. 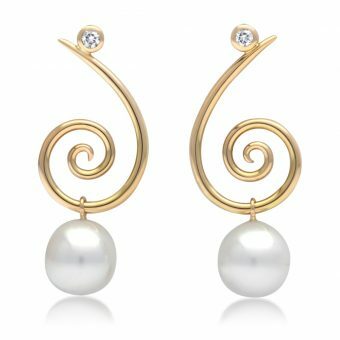 These are a duel purpose earring. 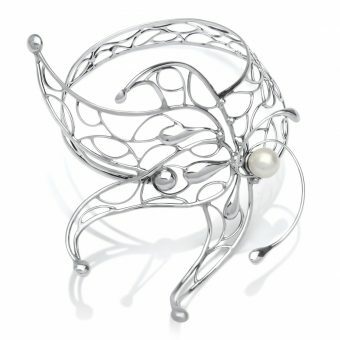 They can be worn as a fancy hoop or slipped over the top of the ear. As an ear piece. 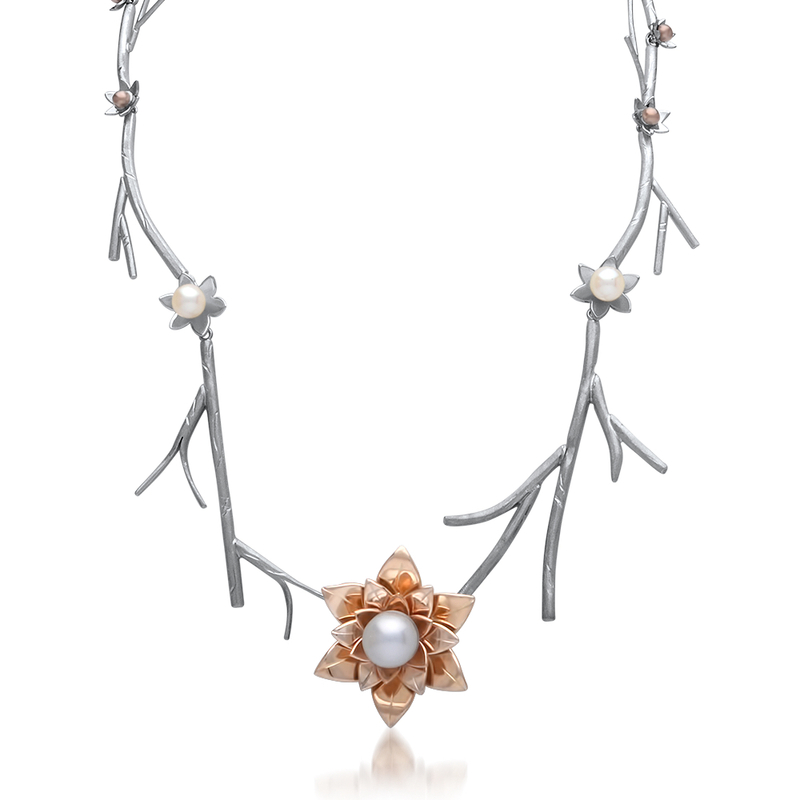 Plants and trees blossoming in spring time was the main source of inspiration for this piece. 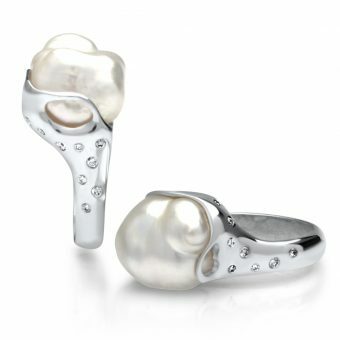 Cygnet Bay Pearls? Well I had to make a swan! 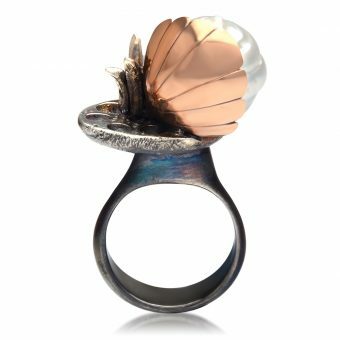 The inspiration for this piece was a fusion of elements: the pattern of light through water to the sandy bottom; rise and fall of the empires; and mans striving for beauty, that is both enhanced and surpassed by the beauty to be found in nature. An independent valuation has been made and is available upon request. My grandmothers name is Pearl and I love the combination of silver and pearls. The winged queen ant of the nuptial flight. In early summer the sexual mature ants fly out of their colony in huge swarms. 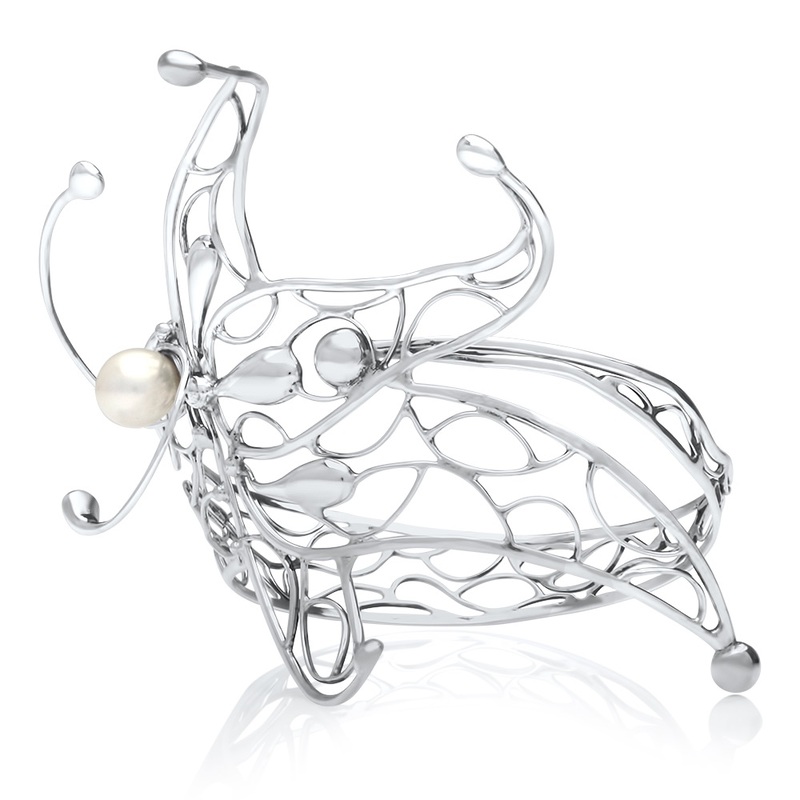 They mate in the air, in order to start new colonies. 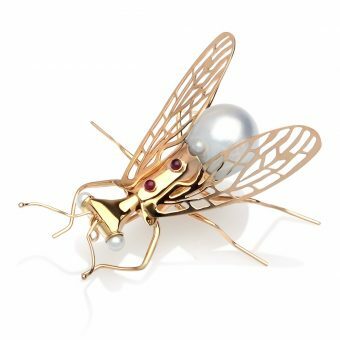 Shortly after mating the male ants die – its life purpose has been fulfilled and the fertilised female-ant search to find a suitable nesting-place to start her new colony. 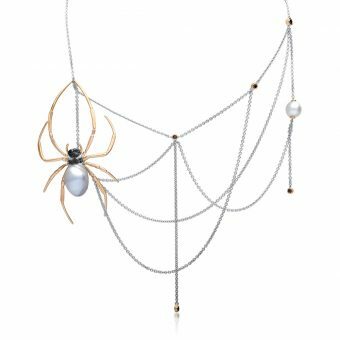 I imagine that the Ant-Queens will look, as beautiful, strong, powerful and their very best, in the competition of attracting the best males. The sixth planet in our planetary system, Saturn, with its circles of broad rings of ice blocks and stones. 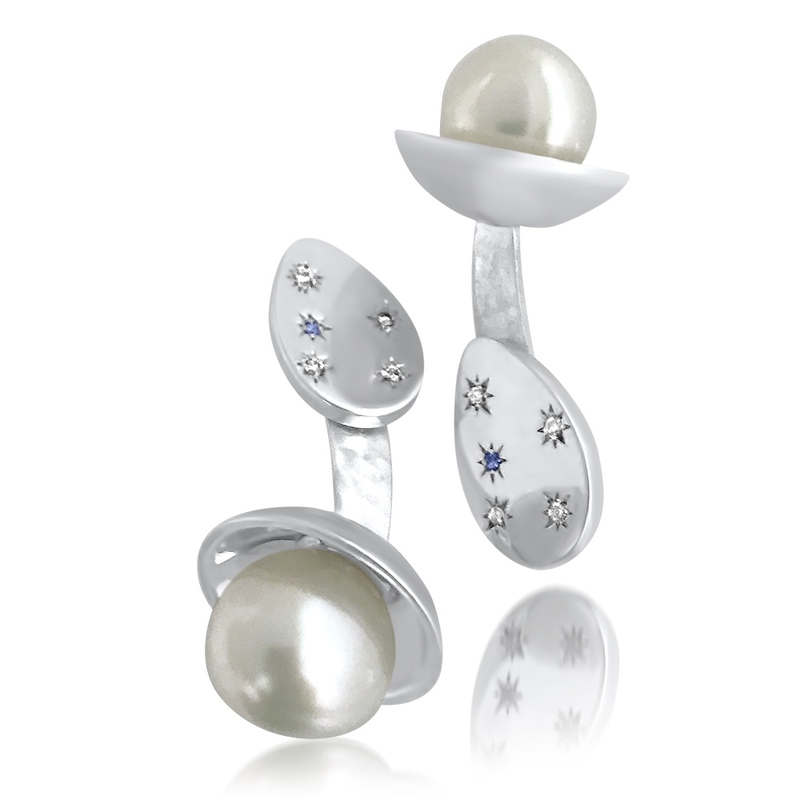 The wholes in the silver-plate create the imaginary stones and ice blocks. 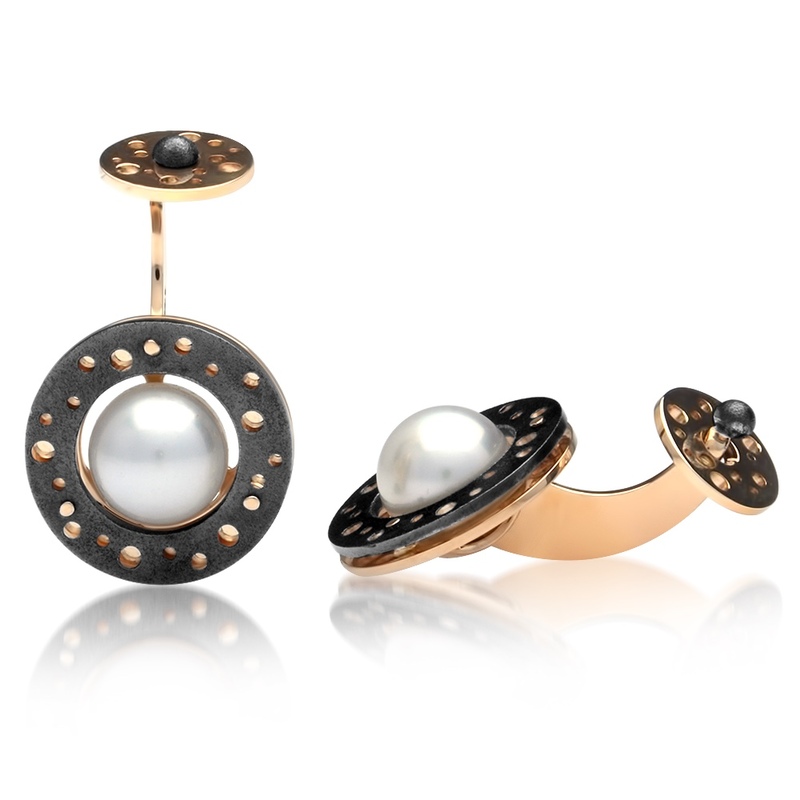 The cufflinks are made so that the Saturn(s) are angled when placed in the shirt, to make a soaring look.